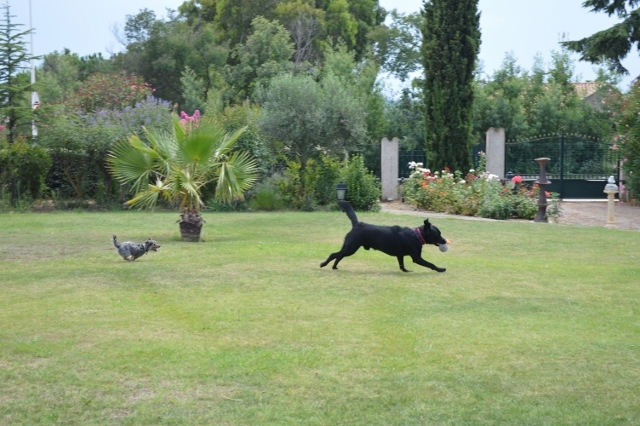 We have spent 6 superbly lazy days at Adonis’s parents’ house in Portiragnes, where the most strenuous thing we did was to cool in the swimming pool and walk the dogs around the vineyard at the back of the house. It was wonderful to have that time to rest from the driving and route planning and to spend quality time with the family. We were all a bit concerned during the first couple of days because Huntely, my in-law’s dog, is much bigger than poor little Beano and he just wouldn’t leave him alone, following him everywhere, walking almost above him and licking his back and neck continuously, even wanting to mount him. The first day he kept this behaviour up for 6 hours and we had to resort to locking ourselves in the van with Beano for a long siesta and afternoon break just to keep them apart. Later on, Adonis’s dad came up with the idea of throwing water from a bucket over Huntley’s back and this seemed to do the trick. So, for the next day, Peter kept that bucket of water nearby as a deterrent from Huntley’s amorous advances on Beano and just the threat of lifting the bucket was enough to stop him. Thanks to that, we enjoyed 4 days of more appropriate dog interaction, playing with the ball and chasing each other to everyone’s relief, as Adonis and I were thinking we might have to go and stay at a campsite or the new motorhome aire in Portiragnes beach, which is not that close to the Saysell’s residence, just to keep Beano safe and our sanity intact, but I am pleased to say it never came to that. Instead, we enjoyed 2 lovely meals out, one on Portiragnes Plage, where both Peggy and I were defeated by our enormous Gazpacho starter and were unable to finish it, delicious as it was, in order to give us a chance to finish our main courses of salmon and duck respectively and our delicious puddings (grilled pineapple for Peggy and mandarine and strawberry sorbet for me). The other even better meal was at L’Ecluse last night on the Canal-du-Midi on the way to Béziers, where we all shared a Tapas starter and we all loved Adonis’s choice of Fish and Chips du Sud (of the south), which had us all intrigued when reading the menu and later found out it consisted of small pieces of fish fried in a thin batter with the chips served in a paper cone! We were all too full for a pudding, but very happy with our meal as we’ve always been every time we’ve gone there. Our break in Portiragnes also gave us a chance to take the van to the garage, as it was making a worrying squeaky noise, both when we were driving or when walking inside it when stationary, and we thought there might be something wrong with the suspension. Adonis kept spraying it with WD40 for about a week prior to our arrival at Portiragnes, but to no avail. Adonis took the van to the mechanic just down the road on Tuesday morning and, after 3 days there, he finally collected it yesterday afternoon, only to be told there was nothing wrong with it and the chap refused to take any payment, as the van had sat in his garage for 2 days before he actually looked at it! Still, Peter gave him €20 for his time and trouble, which we later refunded and, feeling greatly relieved that all is well with our home on wheels, we put back all the stuff we had taken out ready for this morning departure. 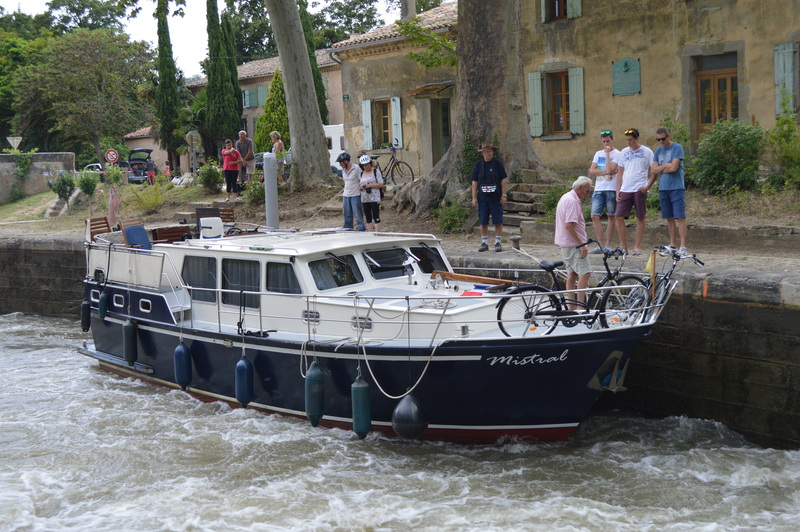 All set and ready to leave by 9.15 am, we said our good-byes hoping to return next summer and headed towards Carcassonne on D612, D11 and D610. Although these roads are generally good, some stretches were being re-surfaced and there was a detour by Trèbes, which slowed us right down. 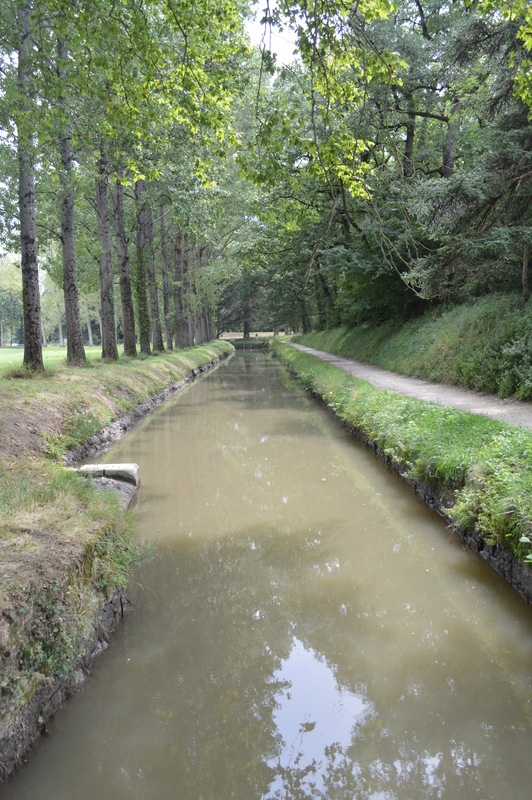 We even considered stopping at an aire signposted at Puichéric thinking it would be by the canal, but it turned out to be right on a hill, away from the water, so we stuck with our original plan of stopping here in Montferrand, a shady aire right by the Canal-du-Midi on D6113, just west of Castelnaudary, surrounded by gorgeous fields of sunflowers. 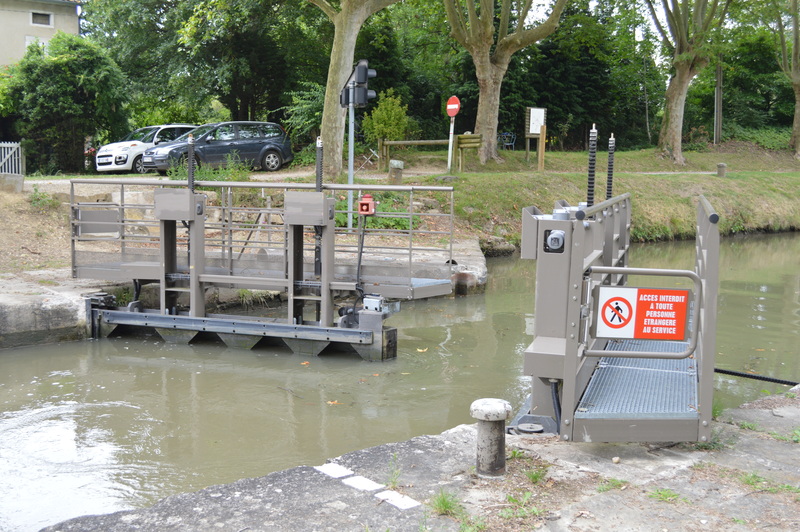 We’ve just returned from an hour-long-walk along the canal and enjoyed the procedure of a boat going through the locks. 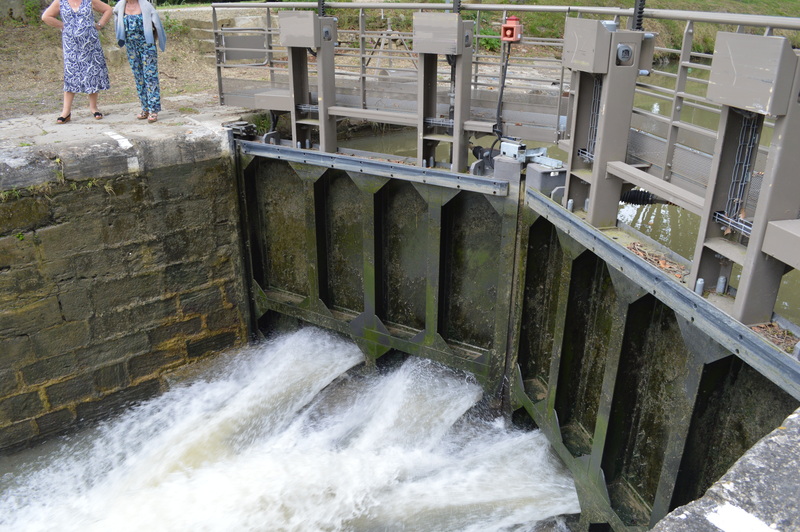 It seemed that everyone on the walk stopped to watch and admire the lock system, which is definitely worth the wait. 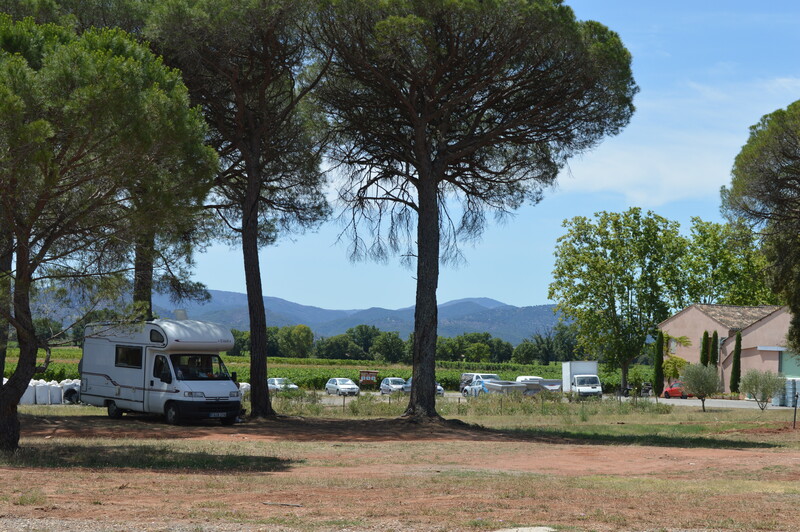 We are thinking about going to the municipal campsite of Boussens tomorrow, about 60 miles west of here, but we’ll have to head north first towards Toulouse and south west from there on A64 to enjoy the better roads. One last time, just because it’s so beautiful! We’ve just seen that the bourne here does not work and won’t be able to empty toilet cassette! This has been a surprise! 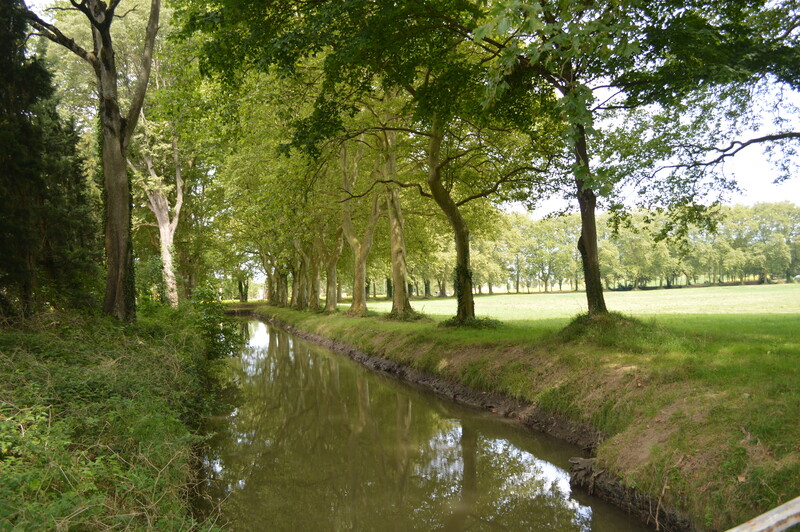 We’ve only found this wonderful aire between Le Grau-du-Roi and Aigues-Mortes thanks to the pre-loaded points of interest on our TomTom, as it does not appear on the Aires guide book. 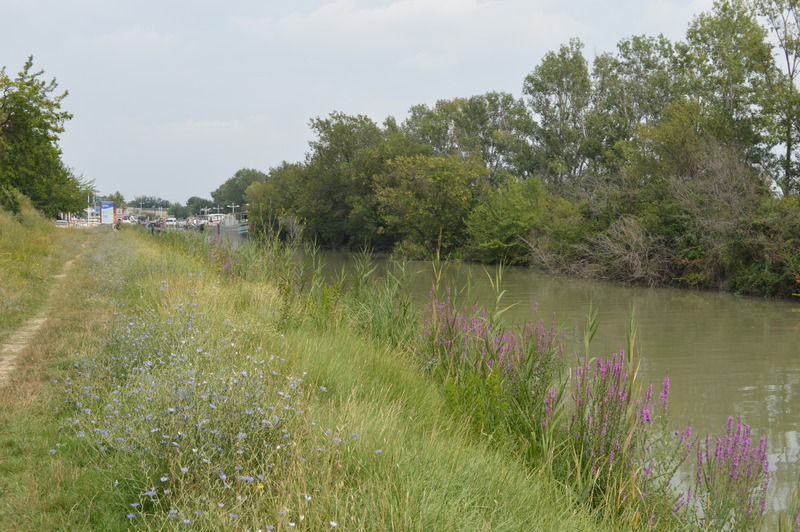 It is set in 20 hectares of nature in the Petite Camargue and it has a restaurant, with fishing included in the €9 daily fee (€12 with electricity). The pitches are generous, with plenty of space for awning, tables and chairs outside. Although it is rather large, there are only around 20 vans here at the moment (6 pm). We are sitting inside waiting for the storm to pass, which is quite spectacular and almost welcome after a very humid day. 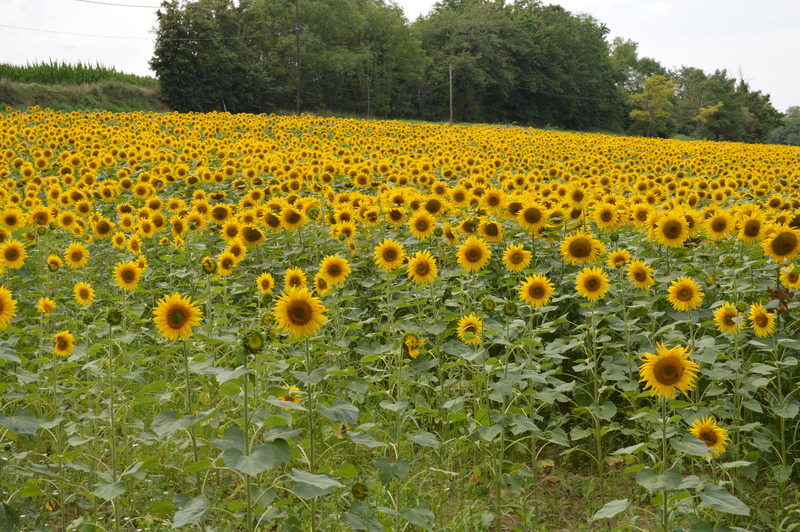 After the storm in La Petite Camargue. Glad it’s not my awning! 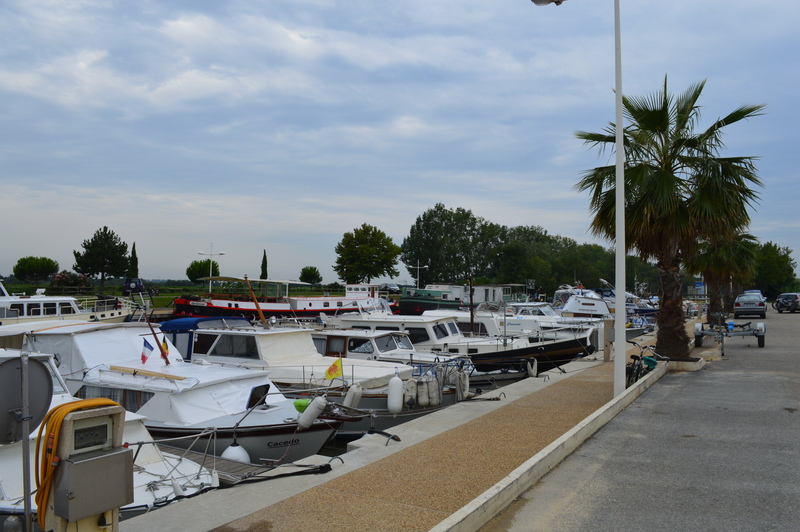 Our original plan today was to stop for the day and night just north east of here at the aire at the Port de Plaisance in Bellegarde, about 10 km south east of Nimes. 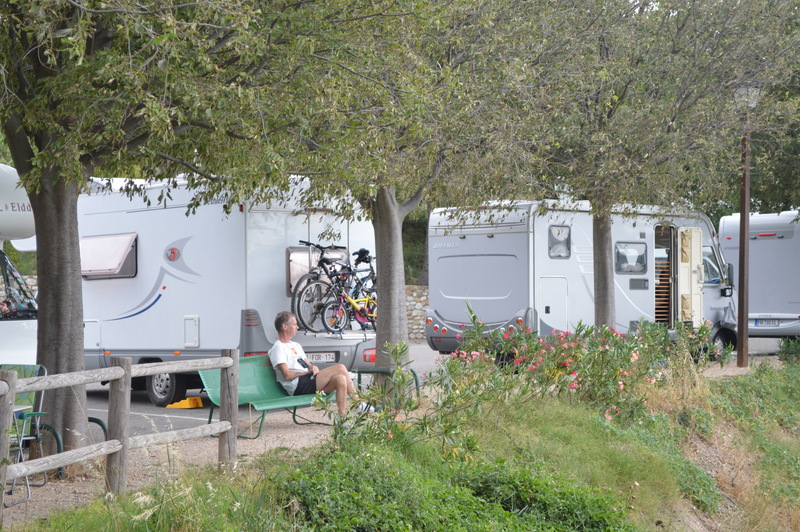 We were there around 11 am and, although it was free and beautiful, with pitches separated by lovely hedges of Bougainvillea, it was too close to the very busy and noisy D38 and after our afternoon dog walk, we decided to make a move and try another aire at La Grande-Motte, outside one of the campsites there, but we didn’t like the look or the price of it, as for €16 the vans were parked like sardines and right by the main road again, so we headed towards one of the aires at Aigues-Mortes outside the city walls and found this one on our way there, so we came to have a look and were impressed by what we saw. 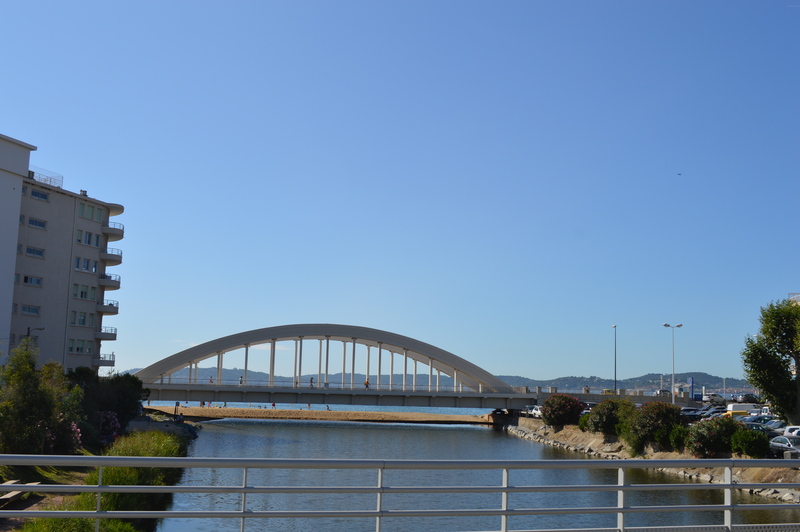 We’d stop here a few days if we hadn’t agreed to visit Adonis’s parents tomorrow in Portiragnes. In the evening of the 23rd July and of Adoni’s birthday eve, we went for a meal at Les Bronzés restaurant, right on Pampelonne beach and enjoyed one of the best meals ever: we shared a delicious large tapa of calamares served with a sweet chilli sauce and garlic dip, followed by a Thai chicken curry for me and Daurade (type of sea bream) for Adonis, accompanied by a jug of the house Rosé, which went down only too well and too quickly! 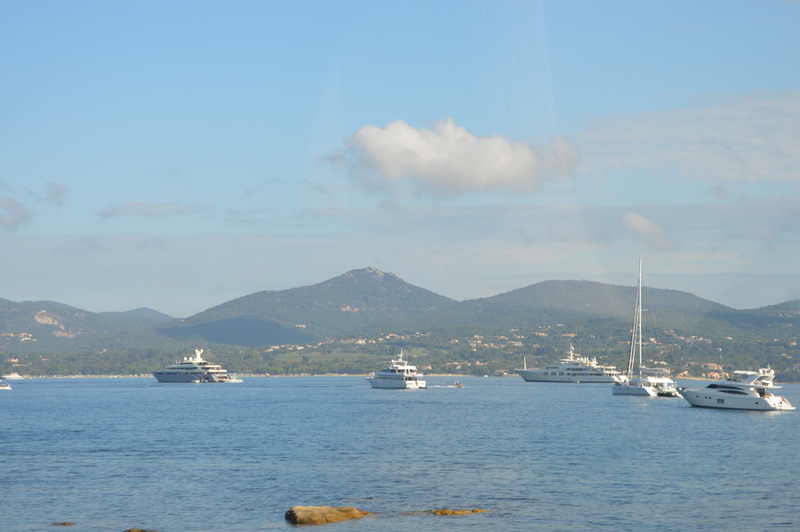 All that, to go with the spectacular view of gigantic yachts on the Mediterranean sea, is going to be a hard act to follow: absolutely superb! 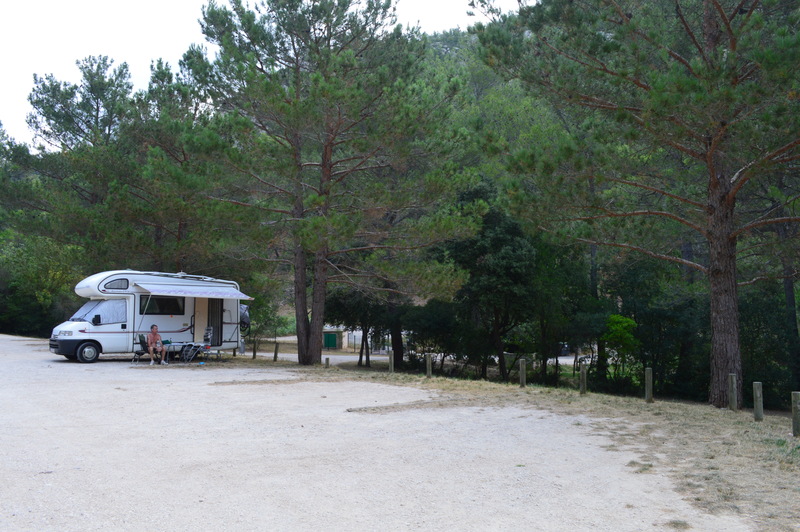 Yesterday morning, we had a total change of scenery at the aire amidst the pine woods of Cuges-les-Pins, very tranquil and relaxing for only €3 a day, with water but no electricity. 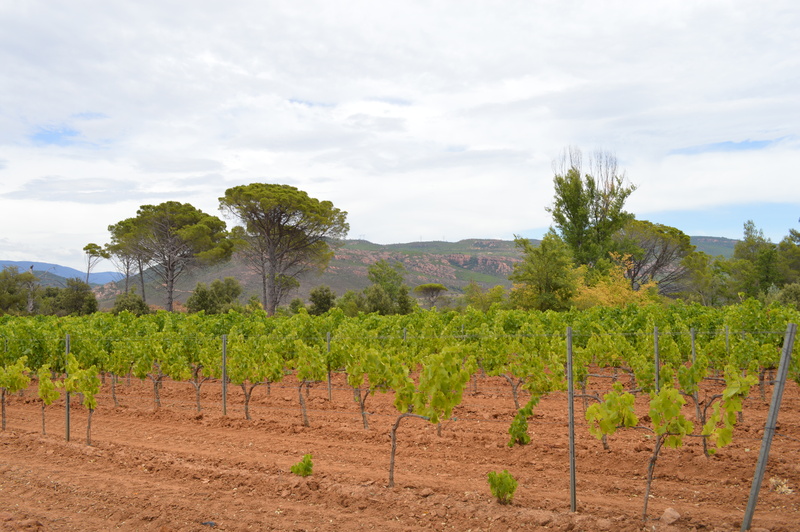 We were lucky with the traffic, as we left Pampelonne before 9 am and the roads through St Tropez and Cagolin were quite empty at that point and, therefore, we had a very pleasant drive, unlike the day before when we arrived. 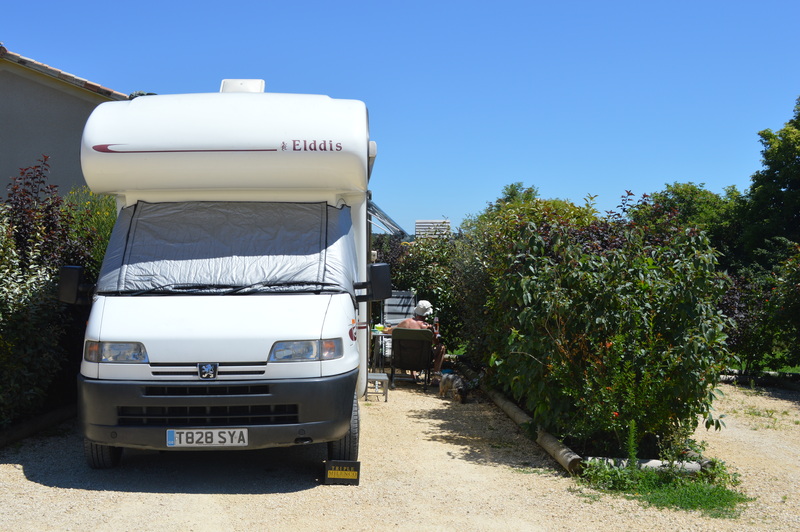 There was, however, a very windy stretch just north of Bormes-les-Mimosas on the D98 towards Toulon, but Adonis handled it well and I was very glad not to be at the wheel. 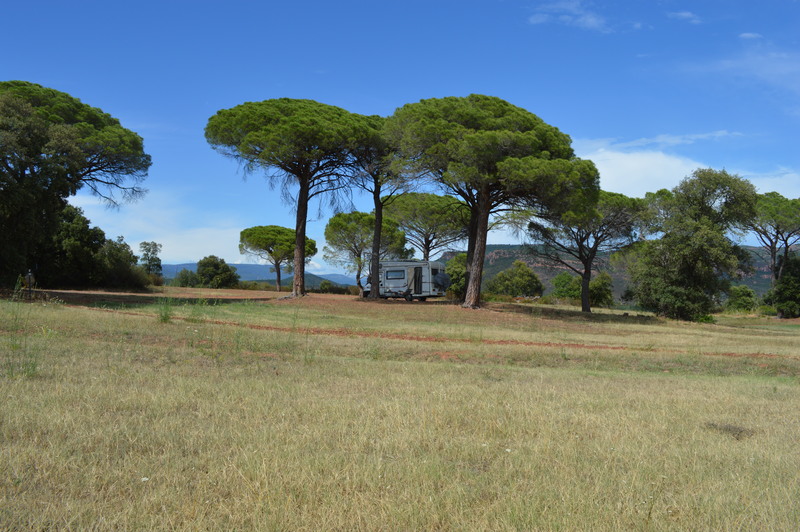 It was still very hot up on that wooded hill and by 4 pm we felt in need of a cold shower, for which we used the water pipe provided to fill up motorhomes. Even Beano has a refreshing splash, as did the wasps, which seemed desperate for a drink, and we were more that happy to provide. It’s Portiragnes tomorrow, where we intend to stop for a few days and have a break from the road. 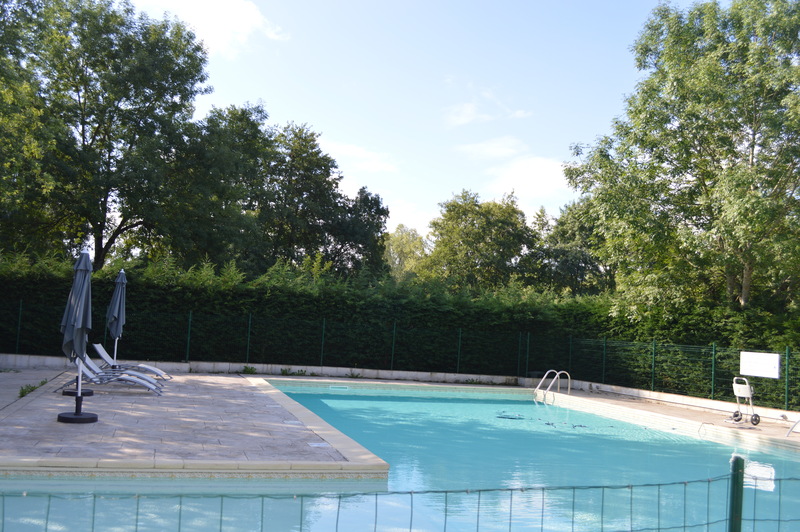 It will also be wonderful to have access to the Saysell’s swimming pool! We arrived here just before midday today after spending a very quiet and peaceful day a the France Passion site of Château des Demoiselles between Mui and La Motte, where we had a very warm reception by the hostess and where we did some Rosé and white wine tasting and, as usual, we walked away with half a dozen of their fine and refreshing product. 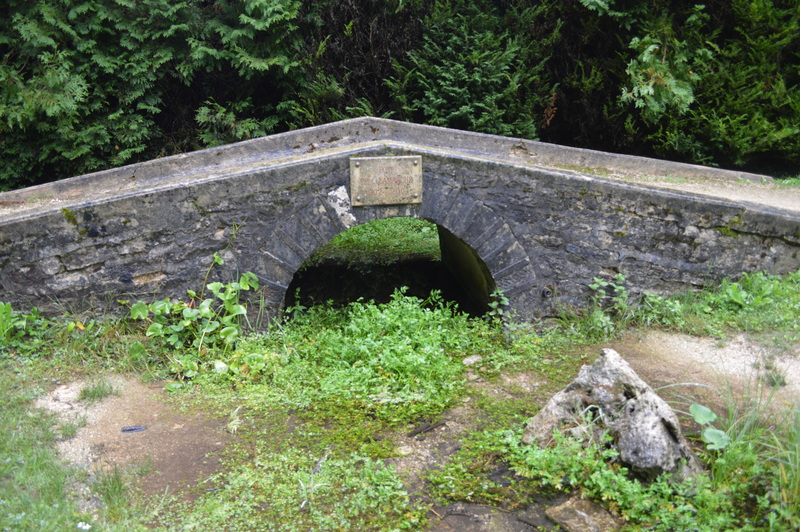 We were told we could stop a couple of nights if we wanted (with plenty of shade at no extra cost) which was good to know, but we really wanted a water source for swimming and cooling off, so the obvious choice was to drive to the coast, a mere 12 miles away as the crow flies. 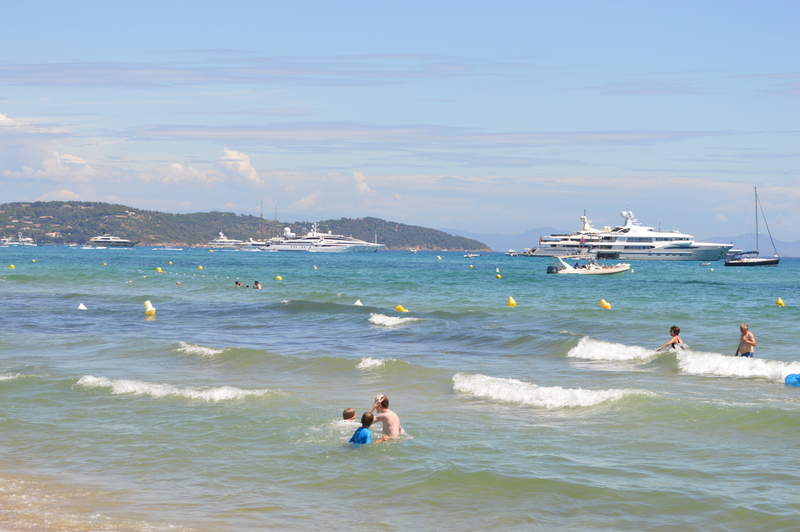 We chose to come to this beach just south of St Tropez, hoping it would be a little quieter and not quite so manic as St Tropez itself or Ste Maxime to the north. As expected and warned by the hostess at Les Demoiselles France Passion site, the moment we hit Ste Maxime the traffic slowed down to snail pace and we were bumper to bumper for about half an hour all the way to port Grimaud and les-marines-de-Cogolin, where we cut across on minor road D61 to Ramatuelle, a very pretty old town where we stopped for baguette and some Parma ham for lunch, as we are running low on supplies and need to stock up very soon. 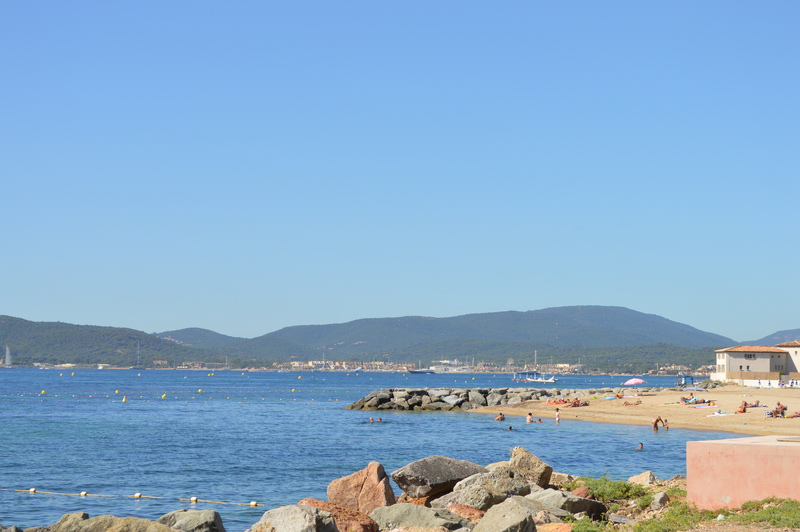 We did not enjoy our drive on D559 at all, even at 10am, as it was already becoming unbearably hot, but it is the only and compulsory route between Ste Maxime and St Tropez. 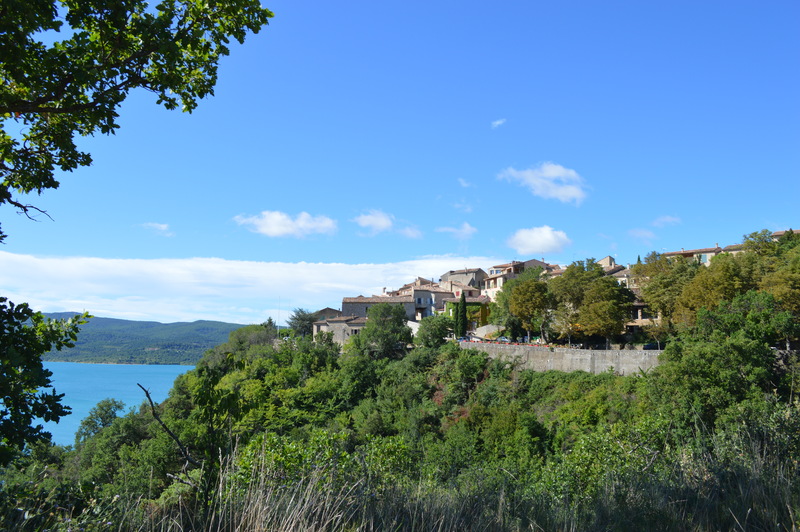 As the traffic was so painfully slow, I did manage to snap a few shots of the towns, which I think might be quite good. Beano is not having a good time of it either, as I don’t think this intense heat really agrees with him and he’s had a runny tummy to boot. Goodness know what he’s scoffed down! 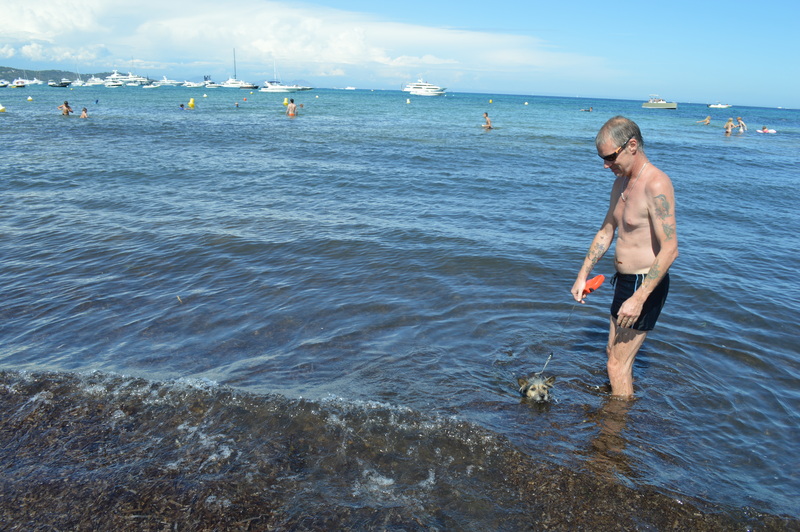 Trying to keep Beano cool swimming in the Med! 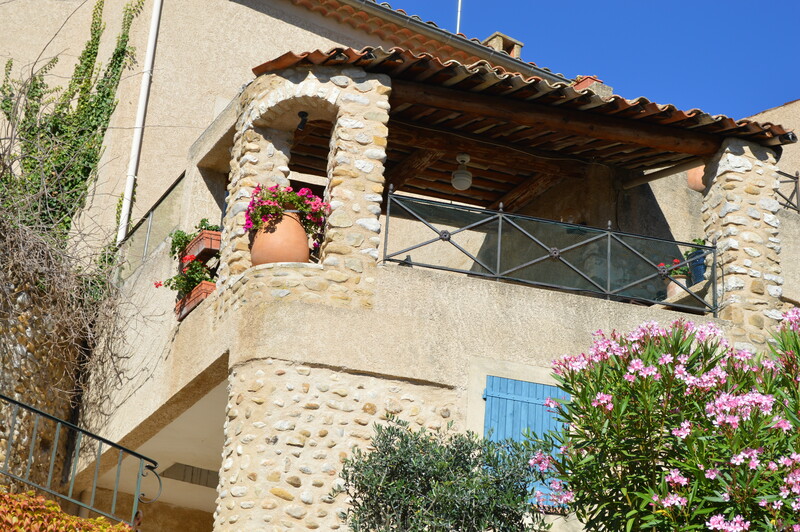 The traffic did ease out after Cogolin and I really enjoyed walking in the charming town of Ramatuelle, even though I didn’t have much time, as Adonis and Beano were waiting in the van on top of the hill in the baking sun. 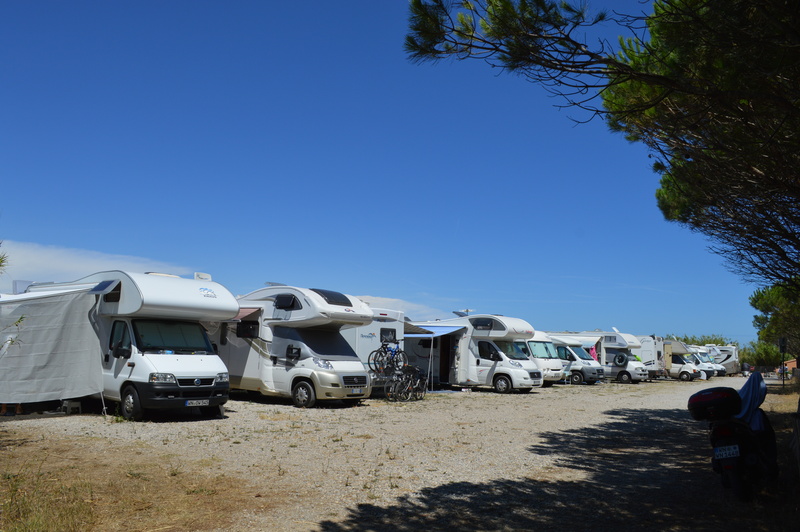 We were lucky to get in this very busy aire, only 200 metres away from the beach, and were very happy to pay the €8 for the day, as it has water, toilets and cold showers (very welcome in this heat). It is also a very pleasant walk on the sandy path to the beach and we even have room to put out the awning! 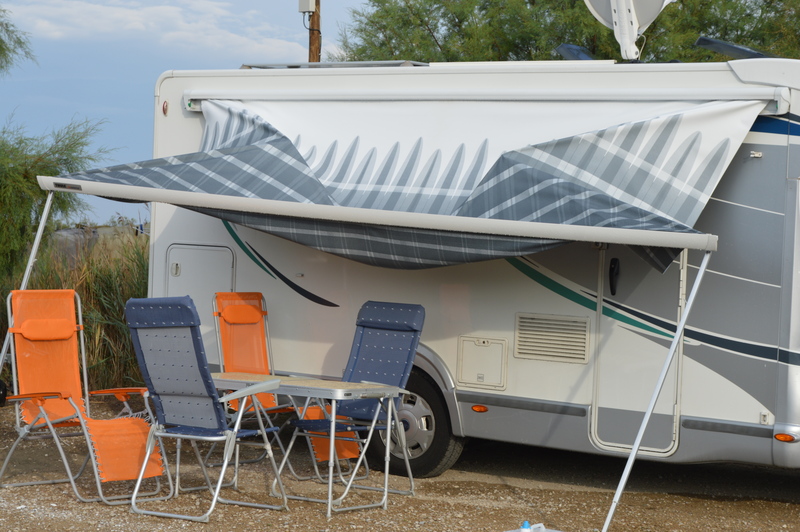 The motorhome aire 200 metres away from Pampelonne beach! 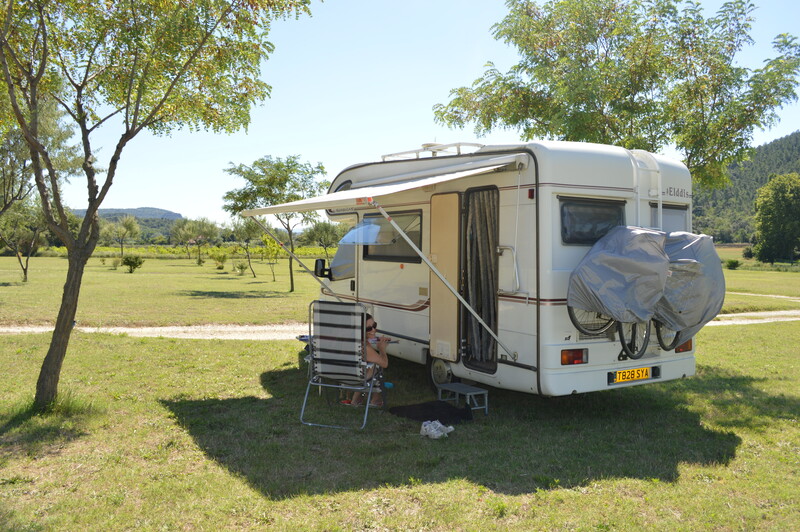 Our pitch at the motorhome aire: just about enough space for awning! 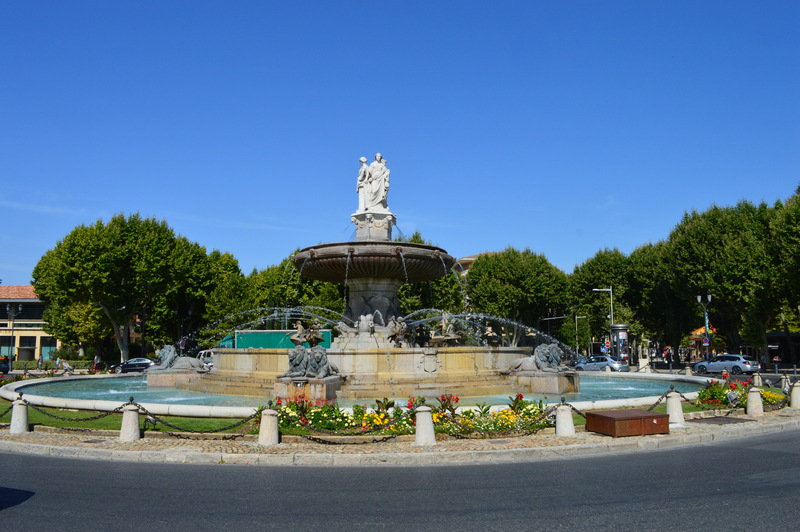 We have decided against going any further east and into Italy due to the awful traffic, so we’ll be going west again towards Portiragnes in the Herault Department to visit Adonis’s parents. Not sure where we’ll be staying tomorrow yet. Qué será, será…? Wow, wow and again WOW! 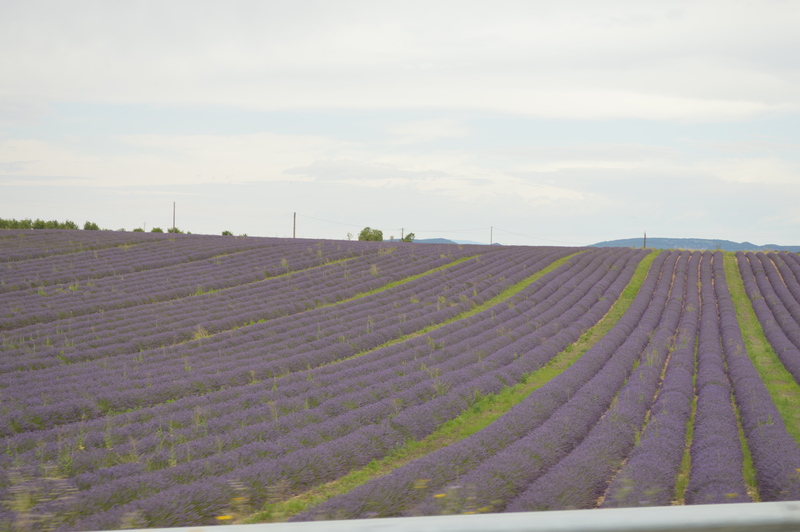 I knew it was going to be beautiful, but the sheer scale of the lavender fields around Valensole is simply breathtaking: mile after mile of endless lavender fields, all growing in neat rows of raised beds, undulating into the distance as far as the eye can see, beautifully set against the majestic backdrop of the Alps. 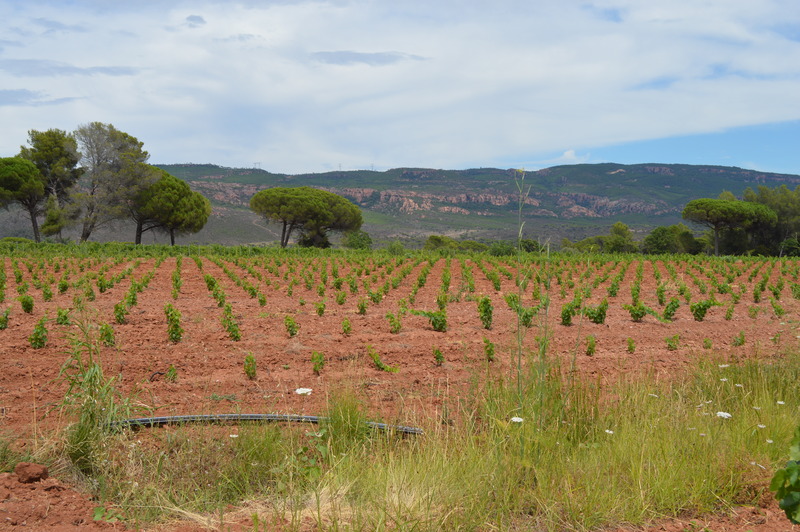 It is simply absolutely spectacular and a true triumph of Mother Nature, not least because of all the beehives helping pollination along the way. Nice to see, as bees seem to be in decline these days. 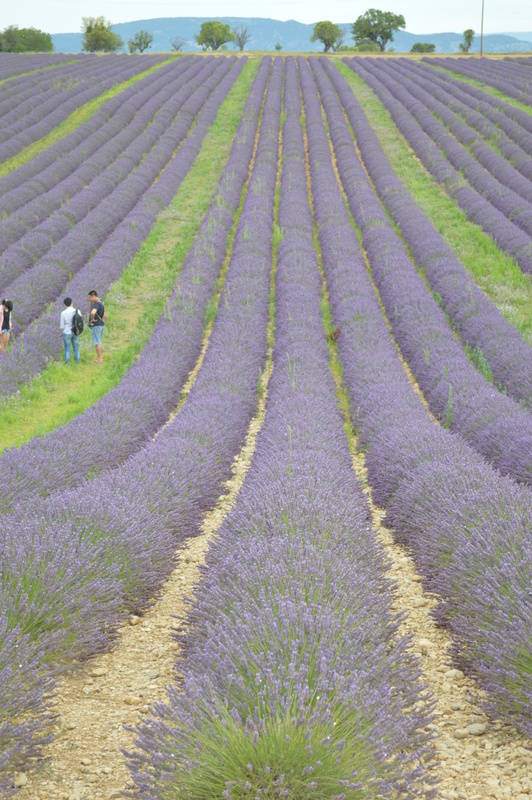 We duly stopped at the first sight of these amazing fields to take some photos between the rows of lavender, like everyone else who had taken the trouble to journey this far, and bought some lavender products at the Terraroma Distillery, both for ourselves and presents for family and friends. 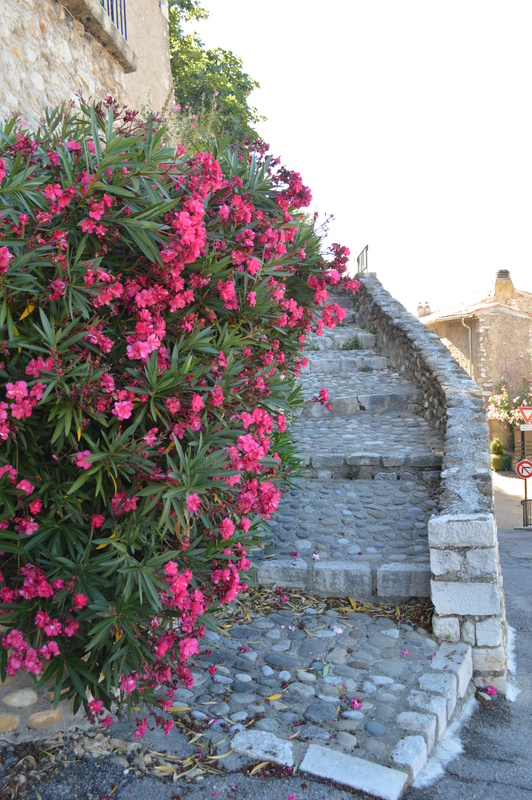 Apart from the stunning landscape, the scent of the plant is simply intoxicating at this point and I’m really looking forward to replicating this sensation both in the motorhome and in the house, to which effect we have bought a fragrance diffuser and pillow mist. 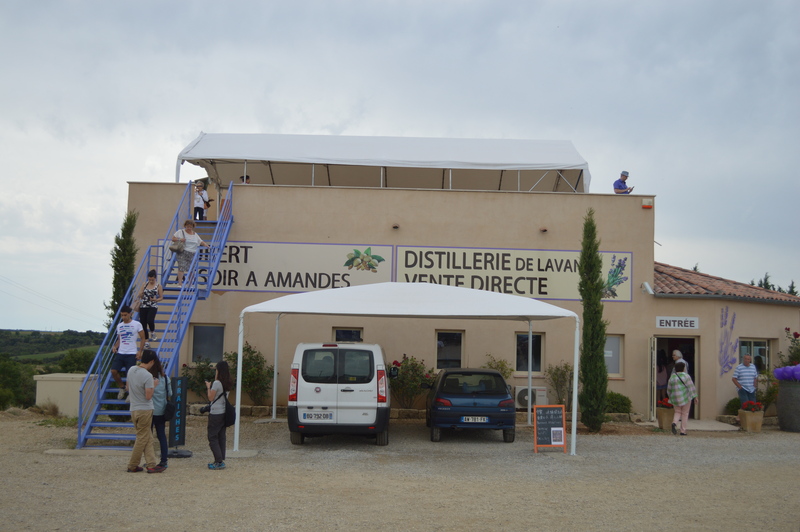 The Terraroma Distillery and shop. We had no problem getting to Valensole from Aix-en-Provence following the D96 north east to Manosque and east from there on D907 and D6, but we found that they were holding la Fête de Lavande today of all days and instead of carrying on the D6 from Valensole to Riez, as we intended, we were diverted about 10 km norht to Poteau de Telle and then south again to Riez before we could finally join the D11 to Ste-Croix-du-Verdon and the lake. 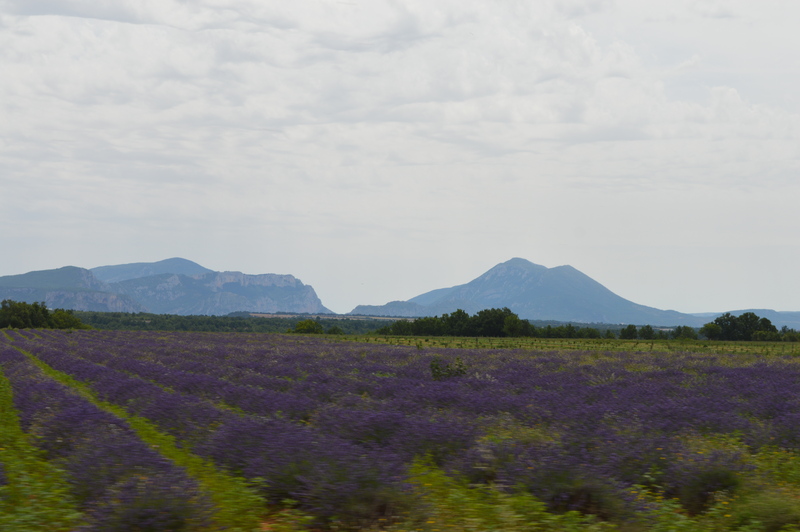 We didn’t mind too much, as it was still early and the scenery was so magnificent and we got to see twice as much of the lavender fields and the Verdon Regional Park. We got there just after 12.30 pm and got a nice parking spot overlooking the lake and what a view it is! 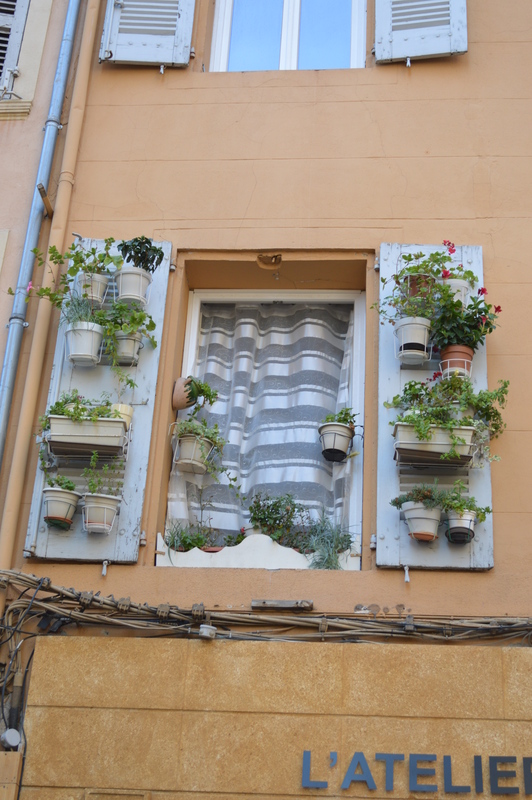 We have found another aire with a fantastic view! It has toilets and free water and it’s only €6 a night, collected by guard in the evening. We like it so much we are thinking about staying another night. 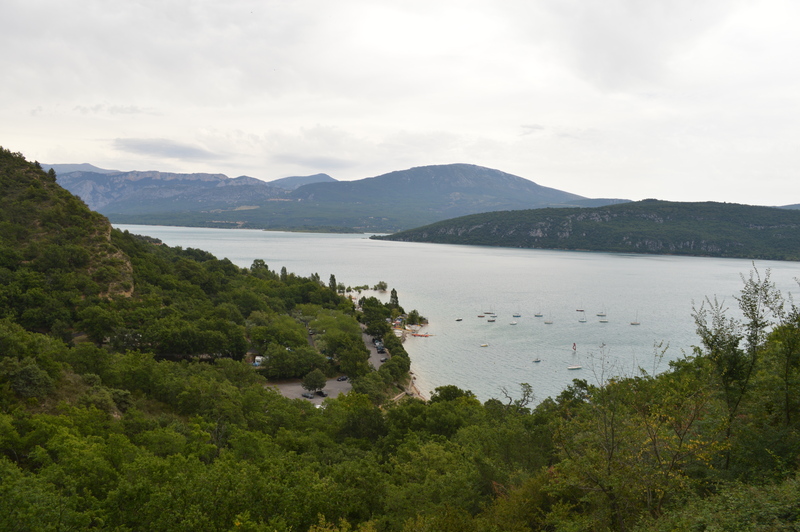 Enjoying the views at our lovely spot at Ste-Croix-du-Verdon motorhome aire. 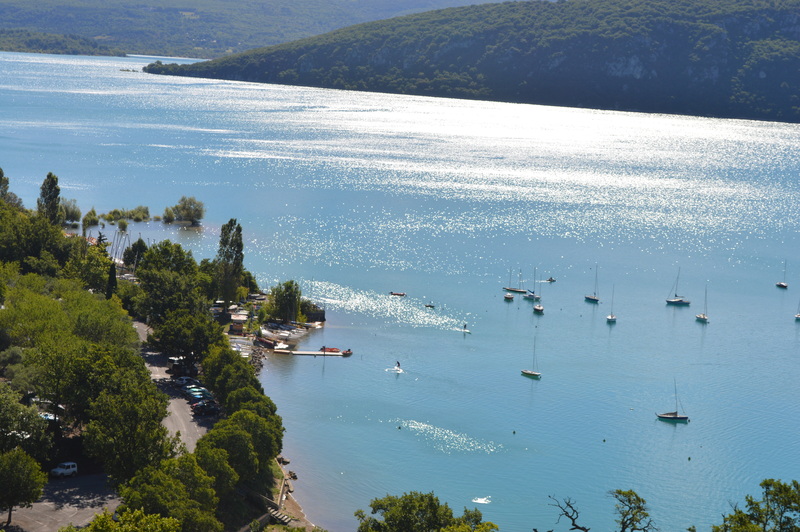 We went for a walk down to the lake and even Beano was happy to go for a swim, but I wasn’t wearing my swimming gear, as the Mistral had been blowing quite heavily when we left the van, but it had blown over by the time we got to the bottom. I would love to have a swim here though, as it is so heavenly. We also went for a beer and a Mojito at the Restaurant/Bar Le Comptoir, as I just couldn’t resist the temptation of sitting at such a stunning location and I was more than happy to pay €9 for my cocktail and €6 for a large Howgarrden with lemon. We both left very contented. Adonis has just come back from another swim and I’m about to cook a Spanish potato omelette. We are so glad we came here! 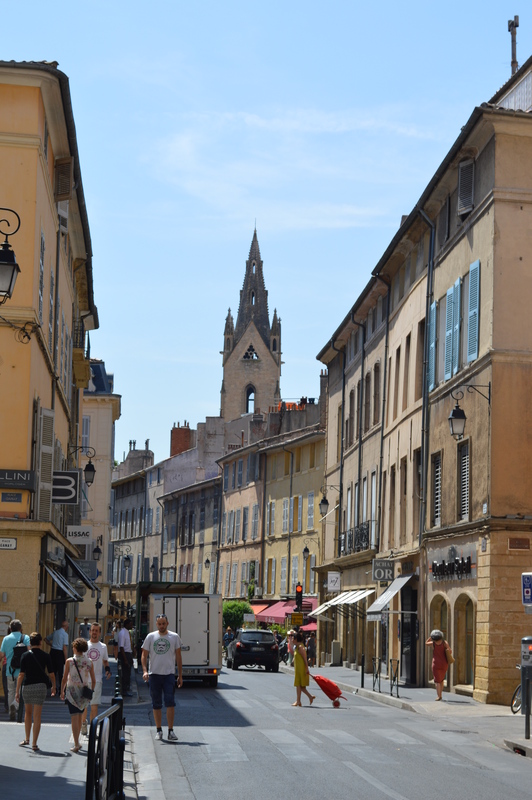 We’ve totally fallen in love with this amazing town, so eclectic and cosmopolitan, yet so very French! 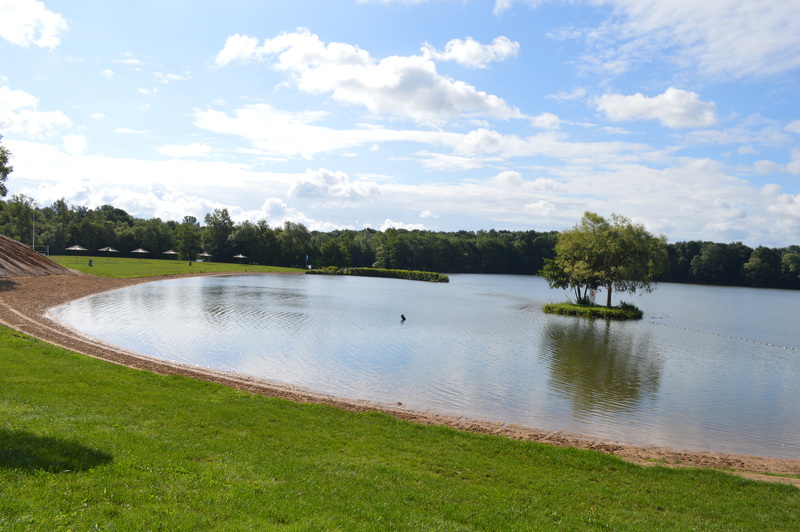 We are only sorry that we could only manage 3 days at this wonderful campsite, as it’s fully booked for tomorrow and we have to leave our pitch. 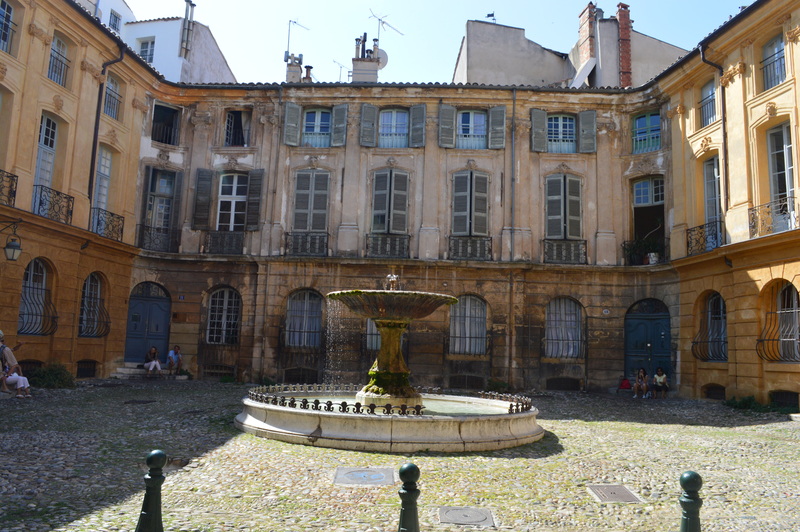 In fact, we were very lucky to get it in the first place and be able to stay for 3 days, as we hadn’t booked (we never do). 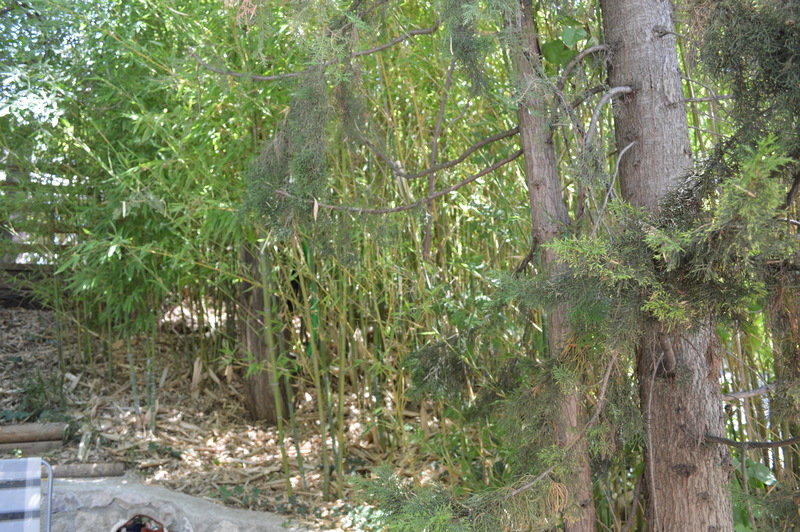 When we arrived on Thursday morning, I was initially told they didn’t have room for us, but the very helpful and friendly hostess found us a perfect pitch by the river, No 36, with lots of shade from a pine tree and the surrounding tall bamboo. 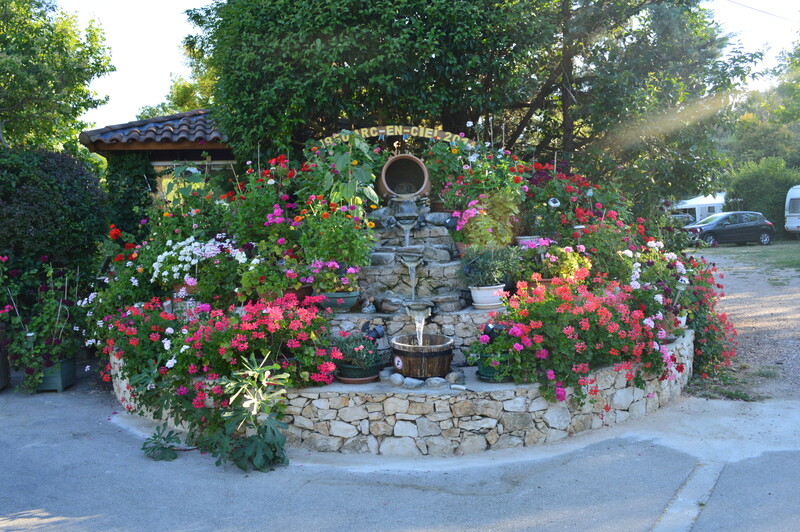 We even have our own water fountain with an old-fashioned stone basin and we couldn’t ask for more: absolutely charming. 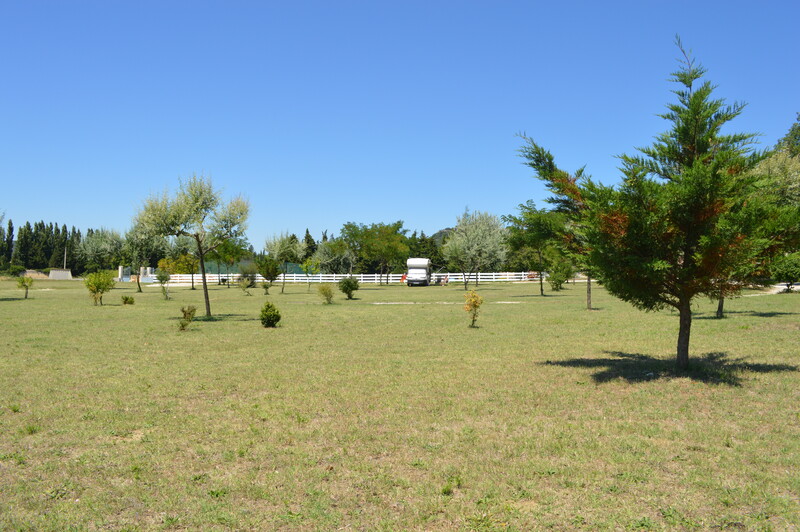 The campsite is spotless, with roomy shower/toilet cubicles and ample space for washing clothes and dishes. 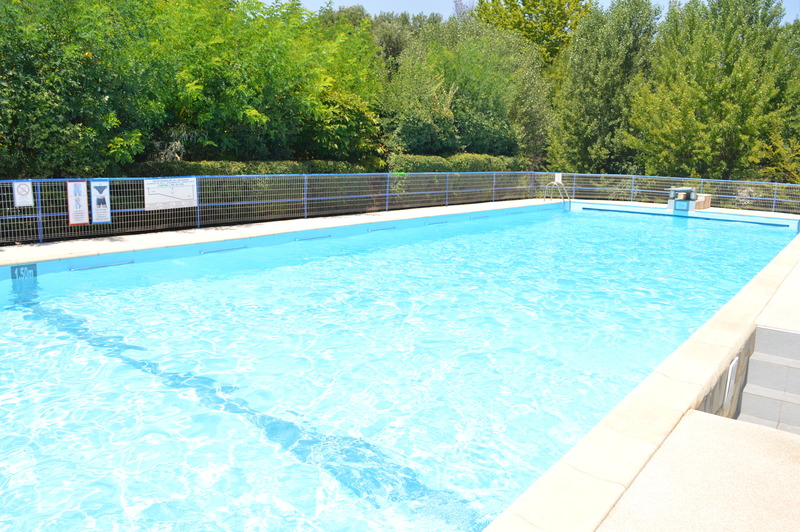 There is also a large swimming pool and lovely views of Le Pont des 3 Saults, painted by Cézanne, and free WiFi! For 75€ for the 3 nights, we are more than pleased. 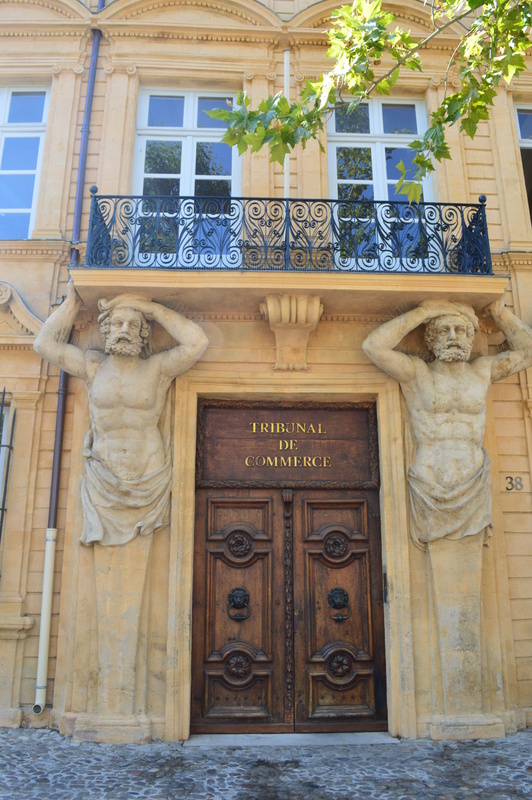 The town of Aix-en-Provence is a little jewel full of life, colour and delicious aromas. 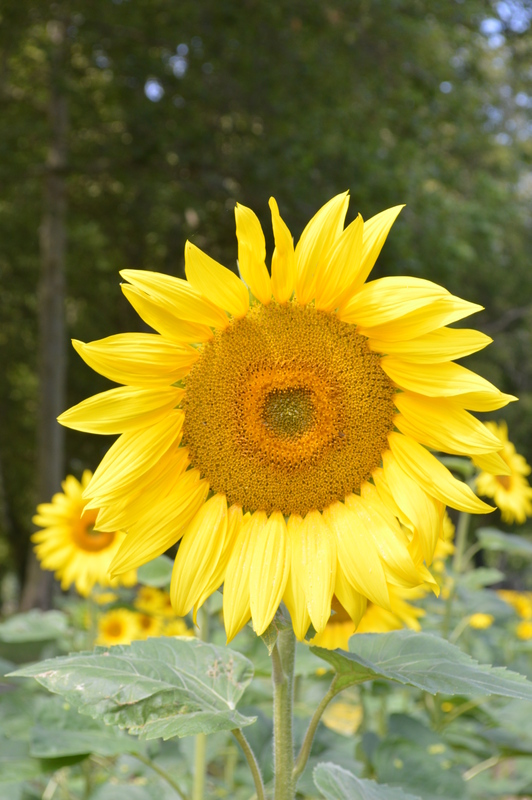 It is a place where you can let yourself be taken by your senses and every corner hides a treasure. 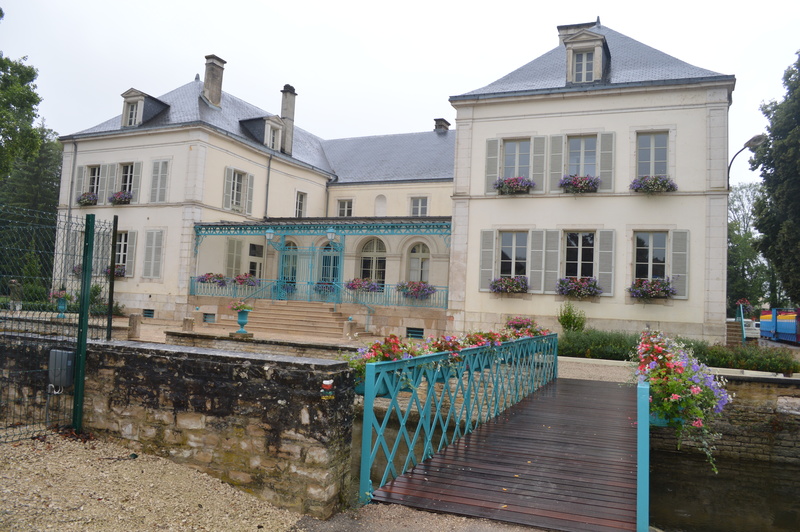 On our first day, we visited the Musée Granet, where they are holding an exhibition of Pearlman’s Collection, which includes works by Cézanne, Manet, de-la-Croix, Van Gough, Picasso, Modigliani and others: a marvellous treat for Art lovers. 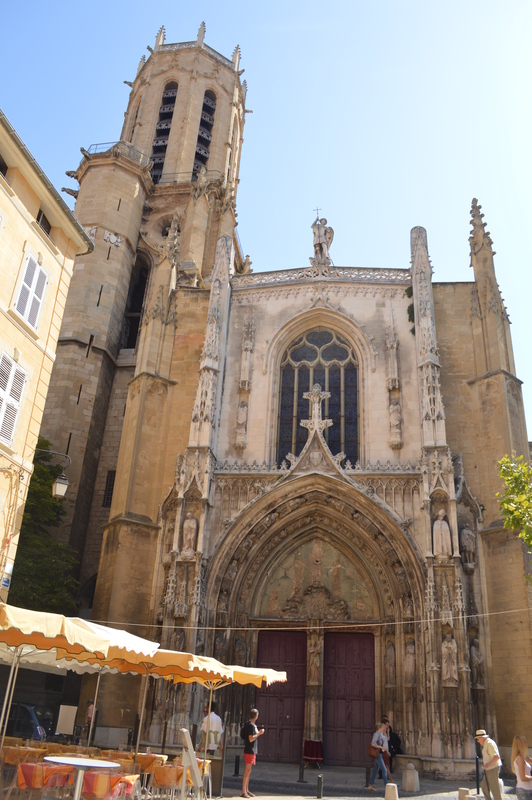 The rest of the time we have enjoyed strolling gently through these quaint streets and marvelling at the town’s fountains and architecture, not least its Cathedral Saint Sauveur, that dates from V to XVII century. We visited this morning and it’s truly fascinating, with its Roman mosaics, Medieval triptychs and Renaissance paintings: a wonder to behold! 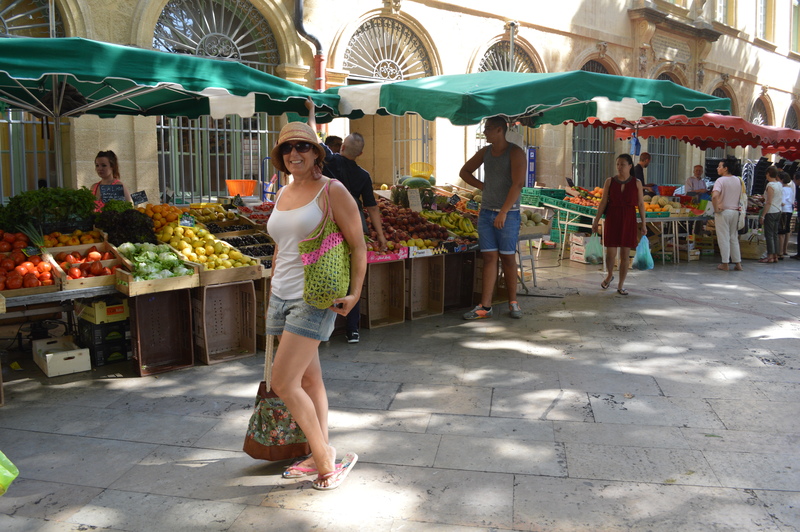 We thoroughly enjoyed the large street markets selling everything you could possibly need and I am forever gob-smacked at the size of the fruit and vegetables here: a gigantic version of what we get back home and so aromatic and inviting. 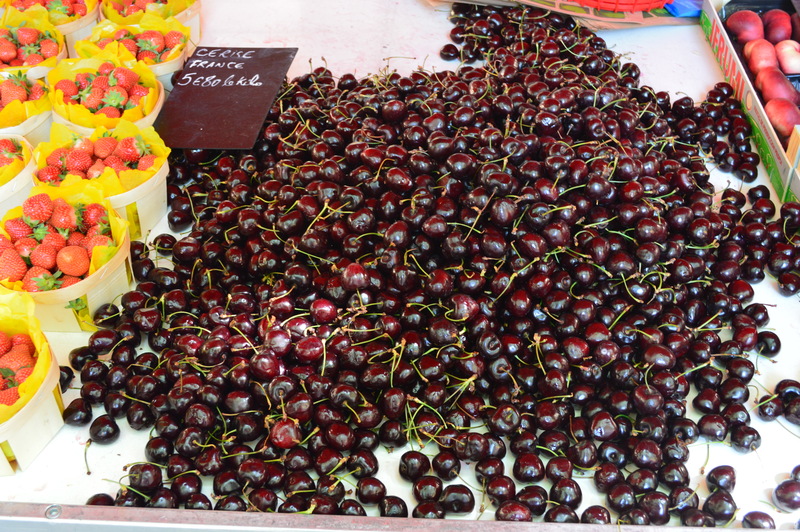 We came back loaded with nectarines, apricots, sanglier (wild boar sausage), herbs of Provence, cherries and assorted flavoured biscuits, such as aniseed, lemon, cinnamon and chocolate: truly delicious. 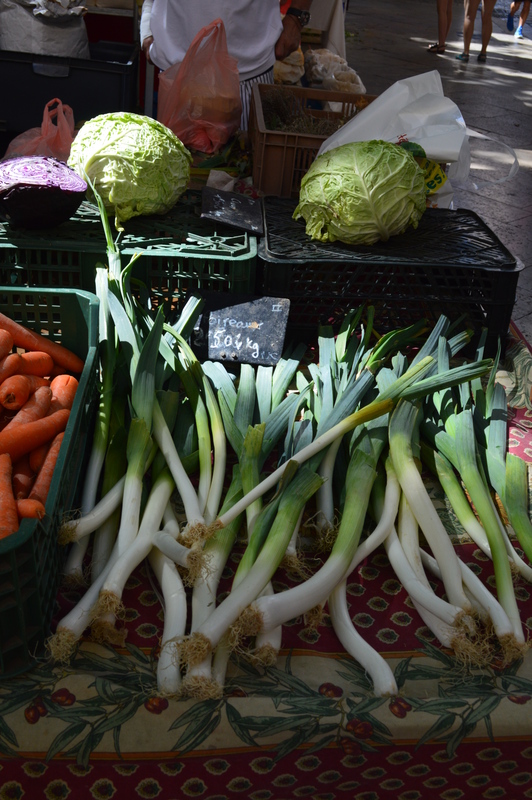 Look at the size of those spring onions! We’ve just come back from a meal out at Le Solferino restaurant on 3 Place d’Arménie, where we enjoyed lamb cutlets and salmon with a nice bottle of local Rosé, all very reasonably priced and most enjoyable, served by a very friendly and efficient waiter who spoke good English: a perfect way to end our visit to this adorable and welcoming city and I for one can’t wait to come back. 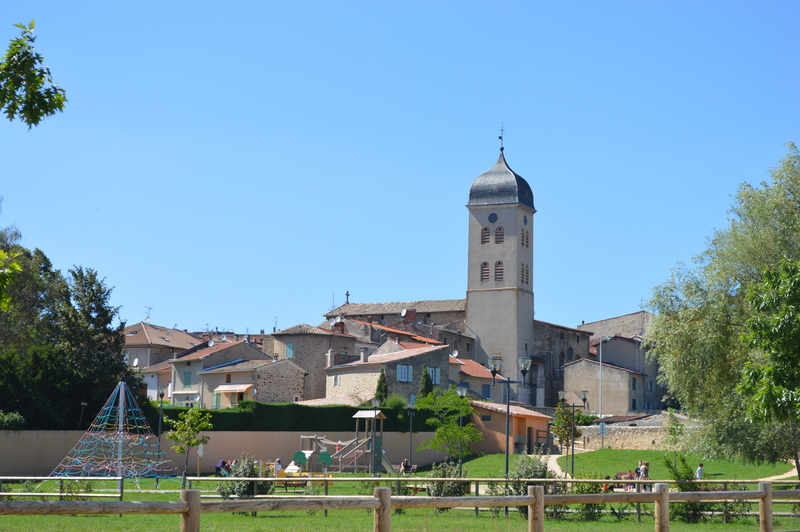 Tomorrow, we are heading slightly north east – east of Manosque, to visit some lavender fields and hopefully buy some lavender products. I am really looking forward to that, as they look amazing in the pictures! 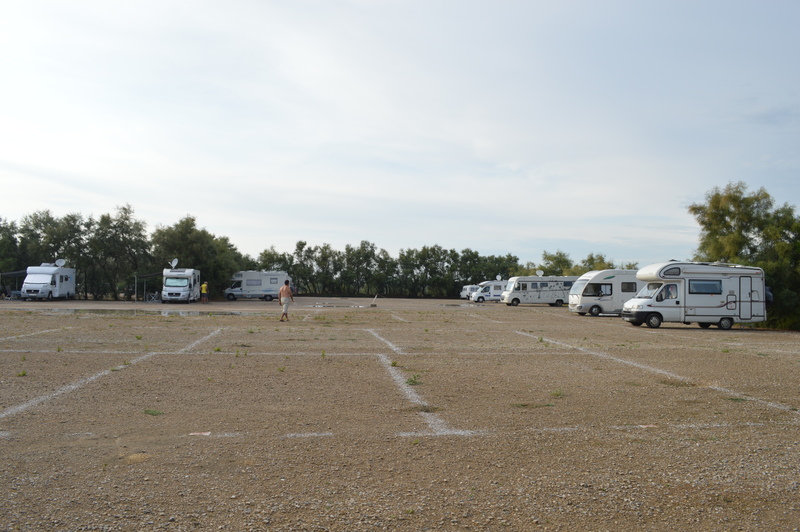 Well, there never was a game of petangue at La Héronnière campsite on Monday as planned. Adonis and I duly turned up at the ‘arena’ at 5pm as advised, but nobody else did. We waited for a bit, but not even the manager who had invited us showed up, so feeling a bit foolish, we went back to our pitch and relaxed for a bit before going for a swim at the pretty beach just outside the camping itself. 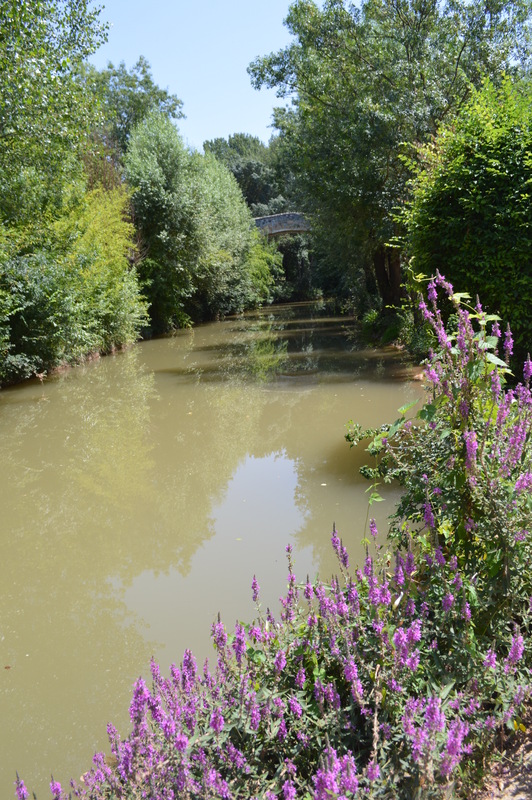 It was quite hot by then – the hottest day so far on this holiday- and the swim was a welcome respite from the sun. The water felt warm where the sun was heating it, so I kept swimming backwards and forwards on the sunny stream watching the red kites flying overhead: very calming indeed. In the evening after dinner, we packed our tables and chairs and brought in the awning ready for an early start in the morning. 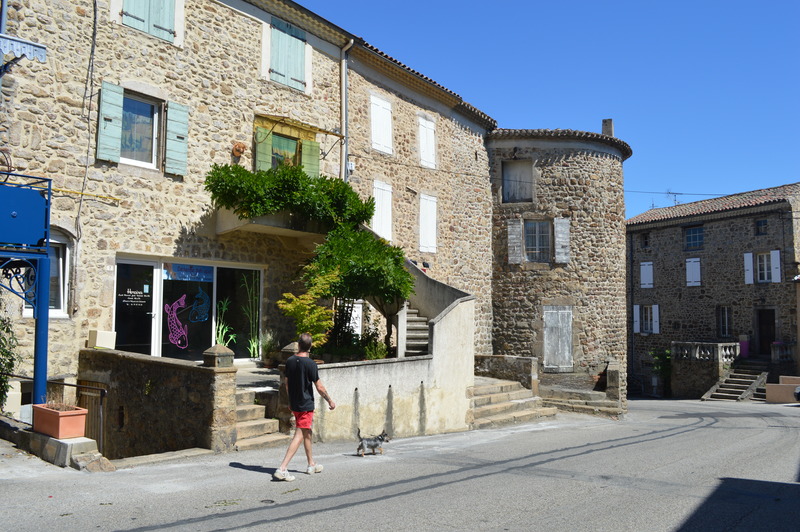 We left La Héronnière by 9.30am and did a quick shop at Auchan at Sennecy-le-Grand to see us through the next 4 or 5 days, then we carried on south on D906 and joined the A6 at Tournus (J27), past Macon and Lyon, where there was a major delay due to the sheer volume of traffic. We virtually crawled for about ½ hour and it was beginning to feel very hot after 11am, so it was a great relief to leave the city behind and drive along the river for a while. 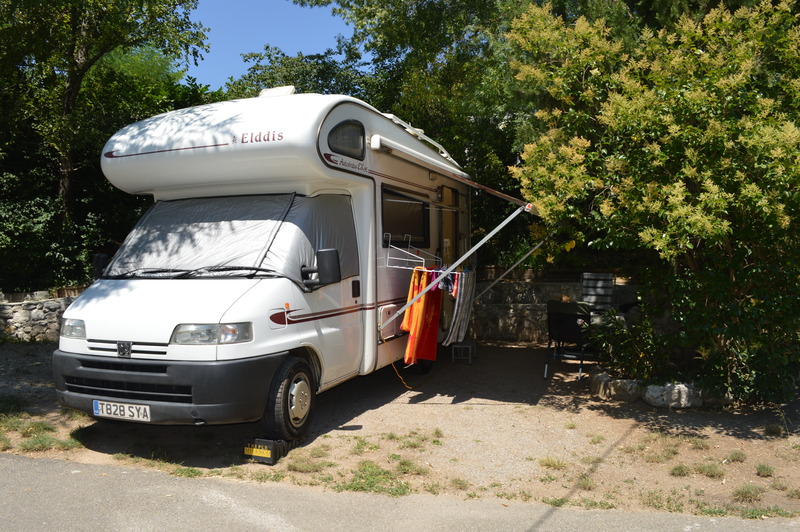 We finally arrived at the free motorhome aire at Boulieu-les-Annonay just after midday and thoroughly enjoyed a cold and refreshing beer before lunch. 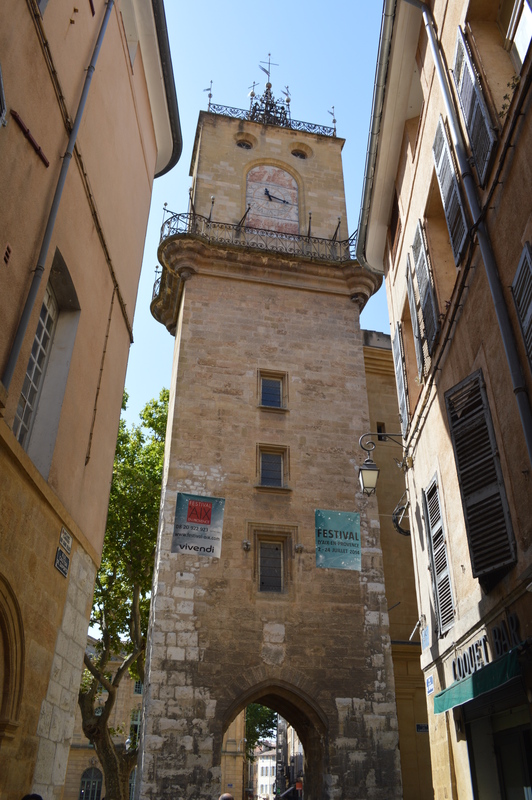 We went for a stroll around this charming little medieval town, surrounded by a wall with 7 round towers still remaining and soaked up the lovely views of its surroundings. 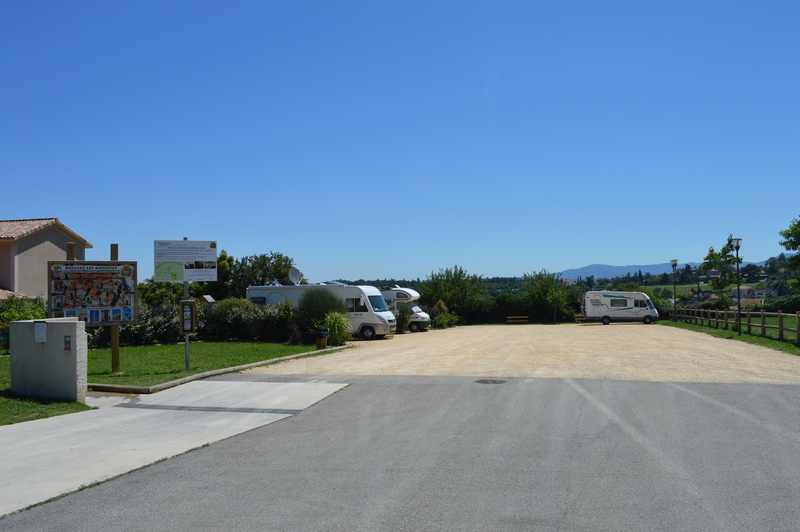 The air provides 6 pitches separated by hedges, but there is also more parking available and this morning there were 10 motorhomes which had obviously spent the night at this welcoming stop. 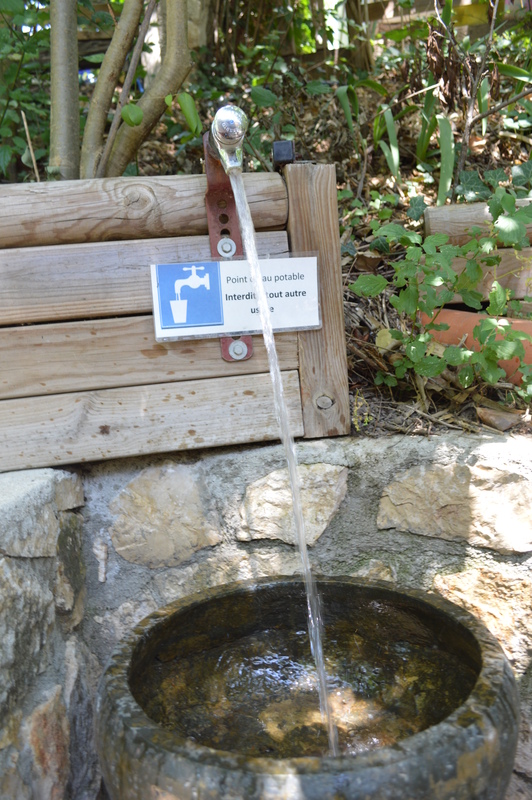 There are 2 water taps free of charge and emptying facilities, but no electricity and we thought it was a perfect stopover on the way to the south. 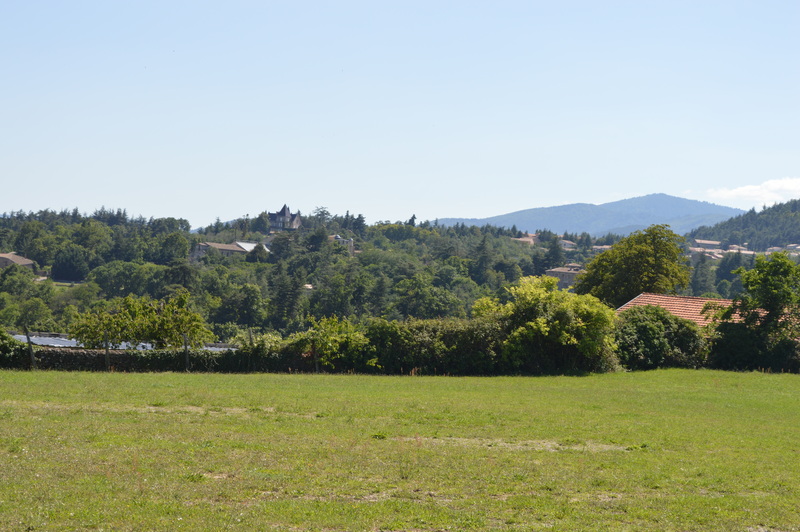 This morning, we followed the D82/86 to Tournon, where we joined the N7 south, past Valence and Montelimar to join the D133 east at Notre Dâme de Montcham and then D571 to this aire at Clansayes (N 44º 22.161′ E 004 47.807′). 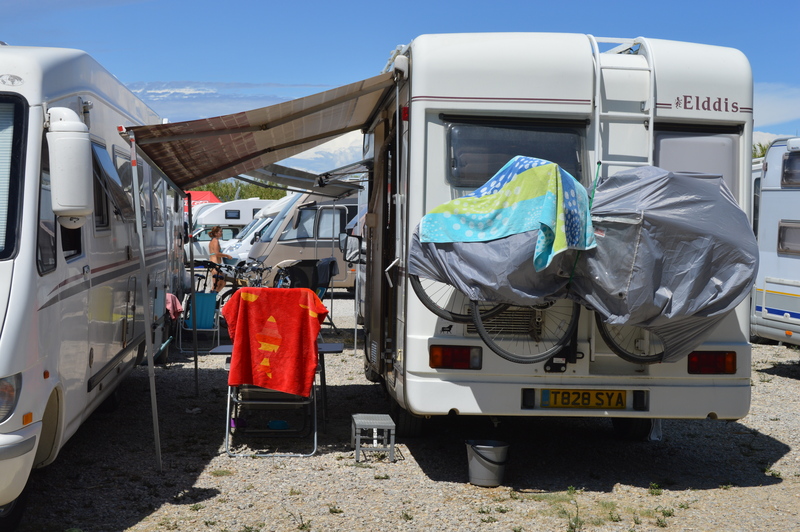 I have to say that, even though it is a beautiful and peaceful place to stop, we felt a bit ripped off as the motorhome aires guide says it is €10 a night plus €4 for electricity and there is a swimming pool and showers. What it doesn’t say is that there is an extra €4 charge for the use of the pool and a further extra €4 for the showers. We also had to pay €1.50 for Beano, bringing the total to €15.50. I also ordered a baguette for tomorrow and I was charged €1.20 for it! The worst thing, however, was when we parked in the shady area under the trees and the manageress I had just paid all this money to came running after us saying we couldn’t park in there because that area had electricity hook-ups, which we hadn’t paid for and, although we explained we were not going to use the electricity, but we wanted the shade because of the hot weather, she made us move to the full-on sun area. I simply felt outraged at this and felt like asking for my money back and leave there and then, but it was nearly midday and we had been driving since before 9am and really needed a break, so we managed to find a spot with a small tree that provided some shade and put the awning out. I just feel her attitude was really mean-spirited and out of order, as there is only one more motorhome here in that shady area and room for at least 5 more. It is now gone 4pm and the only other van that arrived earlier decided not to stay: I wonder why??? It’s a real shame that the natural beauty of this tranquil spot has been ruined by the meanness of its owners; I mean, who refuses shade to anyone on an scorching summer day? It seems totally inhumane to me especially since we paid almost a campsite price. Whoever heard of paying a premium for shade? 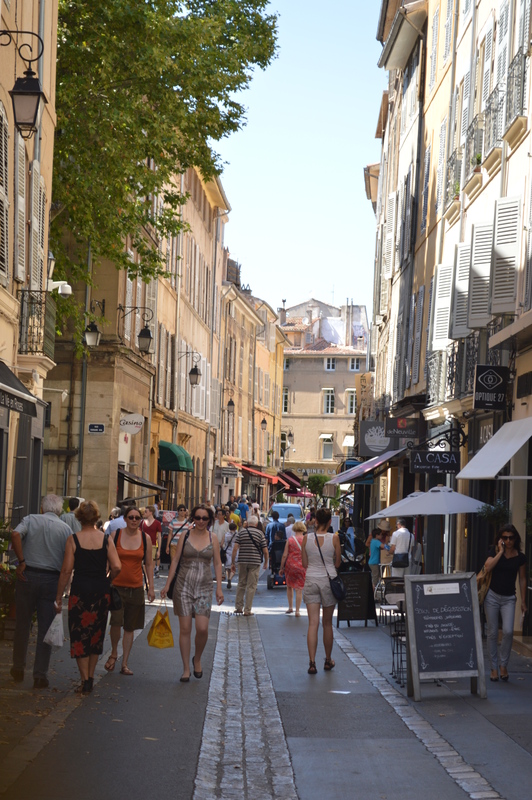 There is nothing like pleasing your customers and I certainly won’t be recommending this site to anyone and perhaps the Vicarious All The Aires France Guide book ought to update their information about this particular site. Would be customers need to know! Our pitch under a small tree at Clansayes misnamed motorhome ‘aire’. Not much shade here. Same from a different angle: Note the full-on sun! 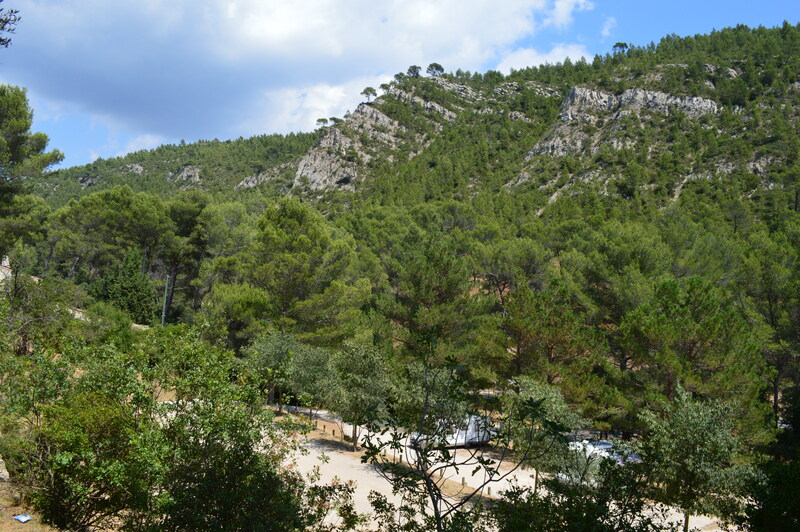 Tomorrow, we shall be arriving at Aix-en-Provence, where we are hoping to stay at the Arc-en-Ciel campsite with direct access to the river, which sounds great. 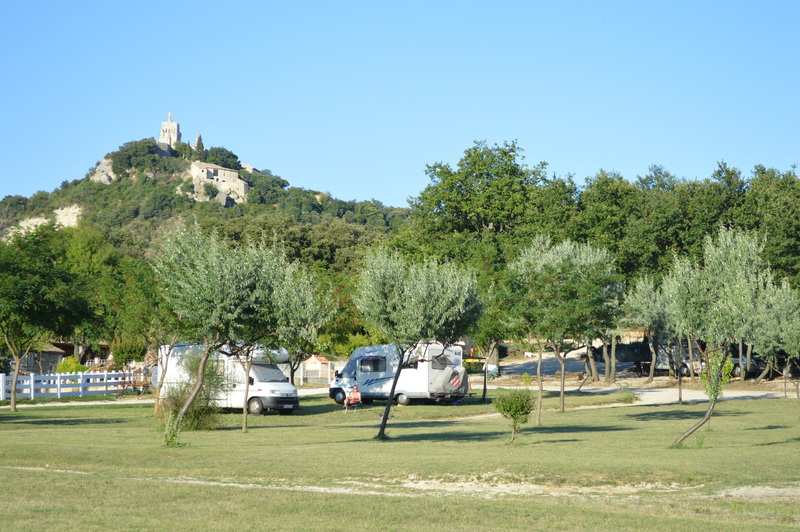 It’s been a very quiet Bastille Day here at this lovely and peaceful campsite just south of Châlon-sur-Saône. 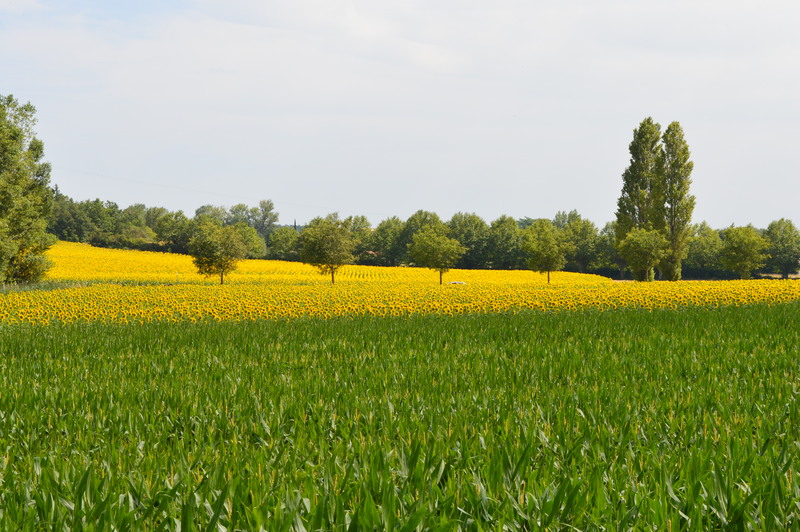 We have pitch No 13 towards the back of the site, which gets very little traffic of new comers and leavers. 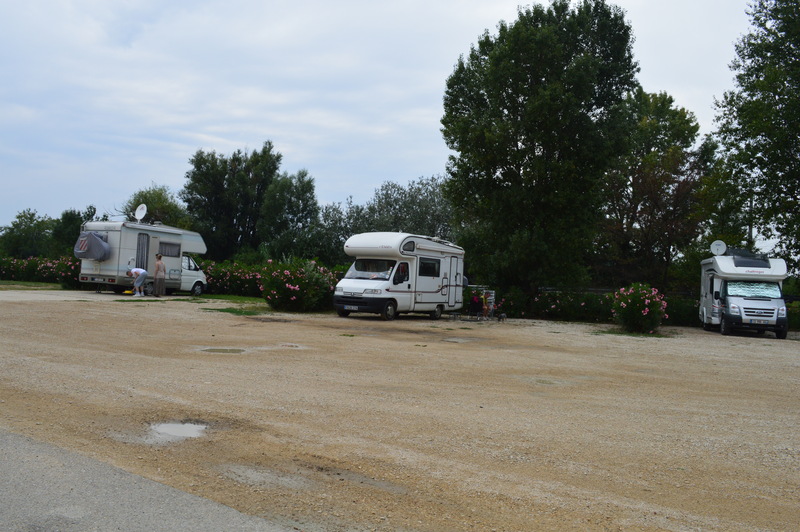 We seem to be the only British van here, with mainly Dutch and French, but most people seem to be on their way somewhere else and only stop for a night, especially the caravans and they mainly stay near the entrance. 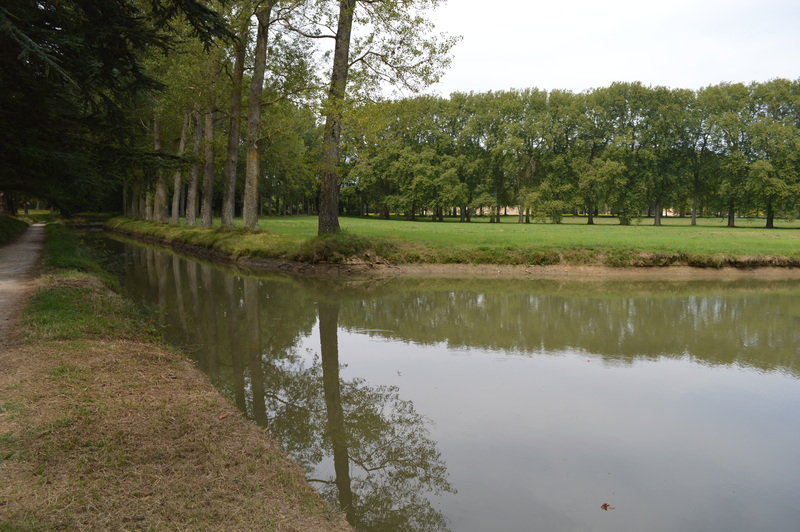 We were running away from the rain of the Somme on our way to Aix-en-Provence and were only intending to rest here for a couple of days, but we enjoyed the tranquillity so much we extended our stay for another 2 days as there is no rush. 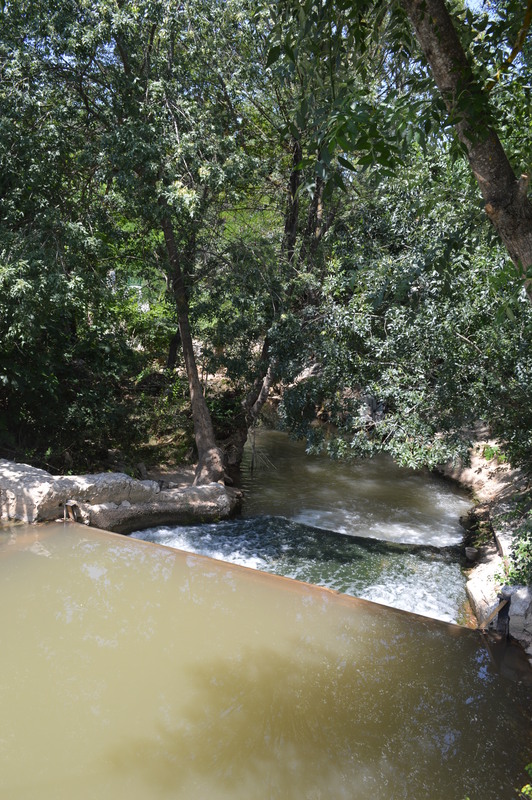 There is a lake just on the other side of the fence and Adonis found a good swim barely 5 metres from it and, although the weather hasn’t been as hot in this area as in previous years, it has stayed warm and dry for most of the time and we’ve been able to have every meal outside. 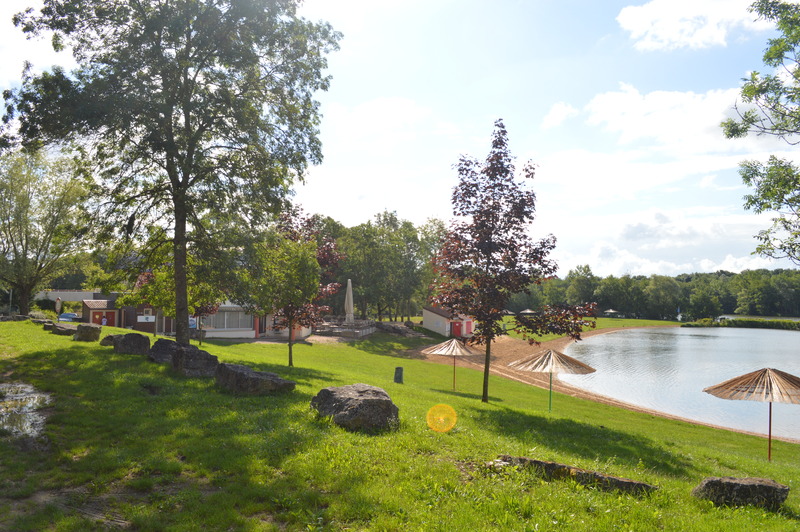 It rained almost solidly from Tuesday to Friday, but the sun has come out with a vengeance at last and it’s 27 ºC inside the van and quite hot outside, so we’ll be able to have a swim in the pool and lake. We’ve been invited to a game of Petanque at 5pm, so I’m looking forward to it later on. 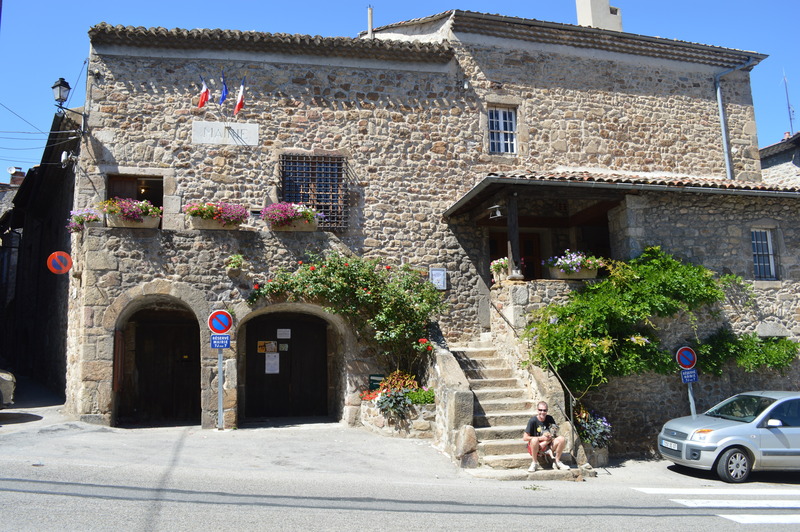 On our way down from Mareuil-sur-Ay, we stopped at the motorhome aire in the little town of Les Riceys in the Aube Department. 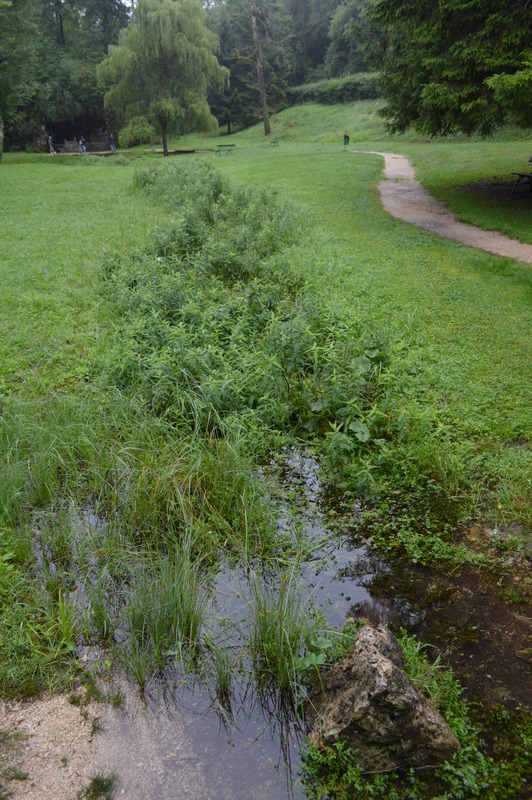 The aire is right by the sports grounds and school, but again, it was very quiet there even with the children still in school, maybe because of the rain. 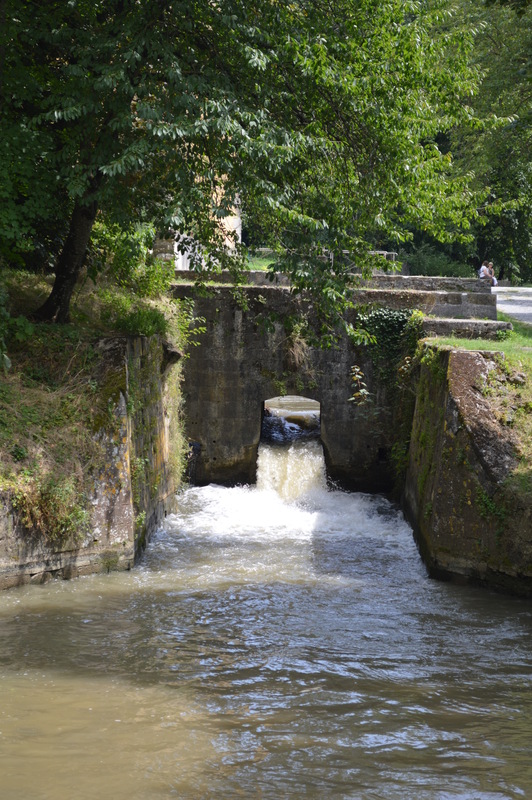 The aire is free and there is a bourne for water and electricity which works with a jeton to be obtained from the Mairie. 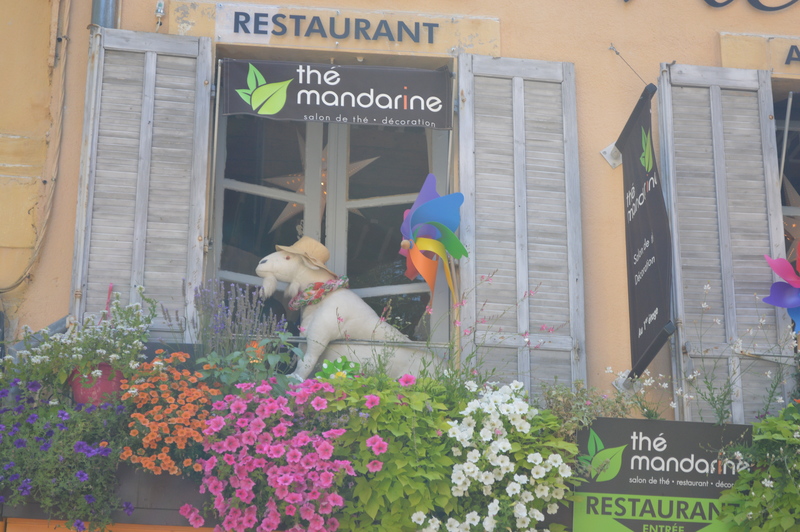 There was nothing much to do there but walk in the small town, which is quite pretty, with attractive flower displays everywhere, especially on the bridge and Mairie, and there are also a few Champagne outlets. 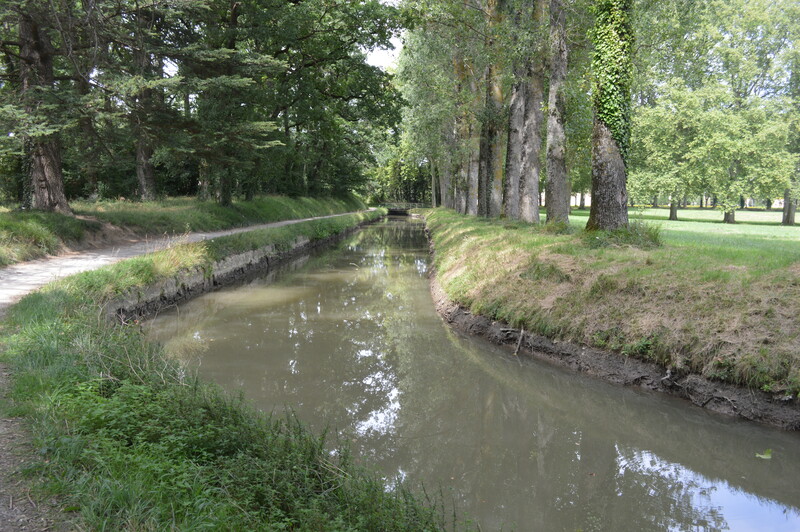 On Friday morning we carried on towards Dijon on D971 and made a little detour just past Chanceaux to go and see the source of the River Seine at les Vergerots. 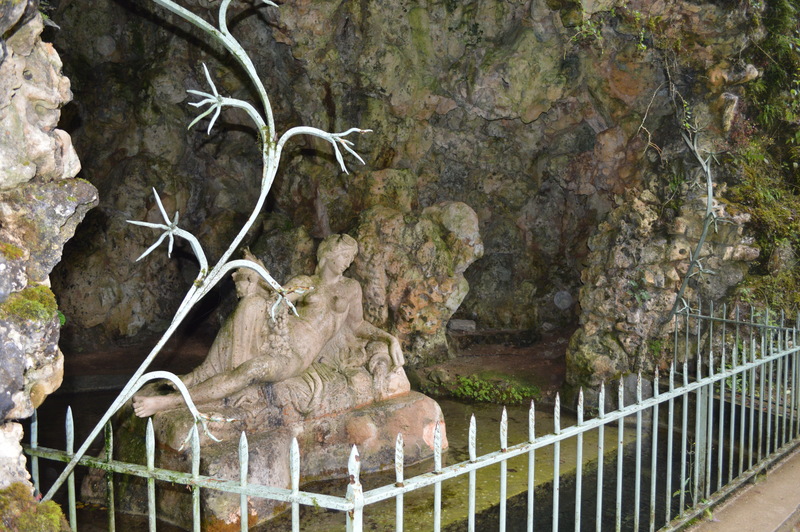 It seems almost incredible that something so small can become so mighty and we really liked the cave where the river is born with the sculpture and first bridge over the small trickle of water which is the Seine at this point. I was very glad that we had taken the time to visit and marvel at this special place, almost like a shrine where some wonderful miracle has occurred, and we had our mid-morning coffee and cake here too just to enjoy it that little bit longer, although it was drizzling and a bit cold, being 500 metres above sea level. 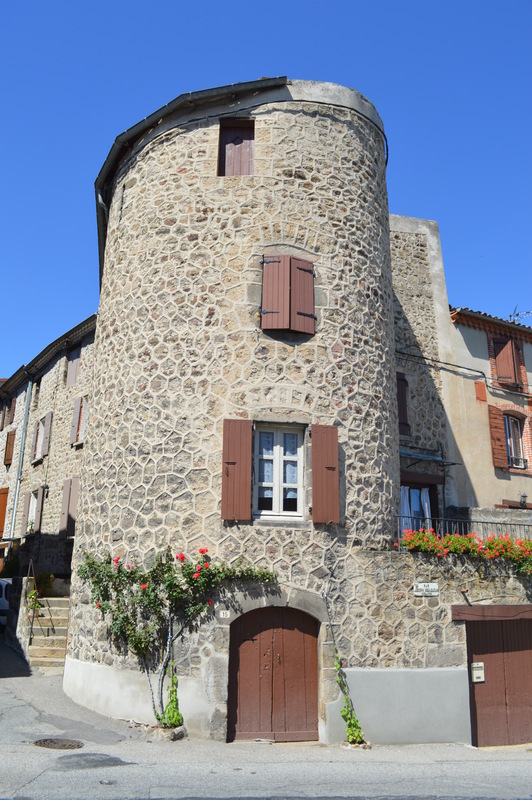 Tomorrow we are heading for the Medieval village of Boulieu-le-Annonay in the Rhône- Alpes region.